Second catalyst: Cranes operate on residential buildings at a construction site in Beijing. China’s economic health is the second major concern that could spark off a crisis for Bursa and the world. IN stock market language, when the charts point to a “dead cross” formation, it means that there is confirmation of a long-term bear market. This is as opposed to a “golden cross” that points to a bull market. Based on weekly indicators emitting from Bursa Malaysia, a dead cross is coming to formation. The last time this pattern emerged was in the first quarter of 1997 and a year later, the “dead cross” chart was fully formed. By that time, the entire capital market was in flames. The ringgit fell against the US dollar, banks were in trouble and the stock market hit a nadir of 261 points on Sept 4, 1998. Technical indicators are no sure sign of market failure. It could change with sentiments. However, time and again it has been proven that the stock market runs six months ahead of what is to be expected in the real economy. As for the nation’s economy, there is no denying that growth is slowing down. There are governance issues with regards to the handling of public funds. However, the fact remains that for all the noise the foreign investors make, the Government did not have to pay a premium when it raised US$1.5bil debts a few weeks ago. This indicates that foreign investors have largely discounted local issues. Nevertheless, the external headwinds are overwhelming and weigh heavy on the Malaysian economy. It is already showing with the slew of corporate results streaming in. Companies are not doing well, as indicated by Tan Chong Motor Holdings Bhd chalking up its first loss in 18 years. Property developers that have made a pile from a great run in the last eight years are seeing miserable sales. Malaysia is expected to see a growth of 4% this year, which is low for a small nation. Nonetheless, we are better off than some of our neighbours. Everybody is cautious, but nobody is able to point a finger to the catalyst that could cause a severe correction to the stock market. Inevitably, it will stem from the economy – whether domestic or global. There are several signs that have emerged which need some monitoring. At the top of the list would be the price of oil that has a close correlation to the ringgit and the economy. Ironically, when crude oil plunged below US$30 per barrel, the ringgit weakened significantly on the view that Malaysia was an exporter of energy and it impacted the country’s revenue. However, in recent months, oil prices have recovered to about US$45 per barrel levels but the ringgit is continuing to see volatility. One reason is that the market is not convinced that crude oil will stabilise at current levels. Conventional economic theory reasons that when oil prices fall, it should strengthen economic activity because the cost of doing business comes down. The International Monetary Fund estimates that for every US$20 drop in price per barrel of crude, the global economy should grow by 0.5%. However, this is not happening because the major economic superpowers of the world are going through their own problems. This points to China’s economic health, the second major concern that could spark off a crisis for Bursa and the world. Nobody can authoritatively put a finger on the state of the debt levels of China, especially those held outside the financial sector. The latest figure being bandied about is that the non-financial sector debt is 279% of gross domestic product, according to data from the Bank of International Settlement. However, the optimists contend that China’s strong growth supports borrowing. Also, the country is seeing high inflation, which in the longer term will cause debt to erode. In the process of growing the economy, China has adopted an approach to weakening the yuan to export its way out. Every time the yuan weakens, the ringgit falls. The third indicator is the highly likely scenario of the US raising interest rates in the second half of the year from the current band of between 0.25% and 0.5%. It is a measure which, if materialises, will exert pressure on the ringgit. The headline numbers show that the US economy is still in the stage of recovery. The unemployment rate in the world’s biggest economy has ticked up slightly to 5% from 4.9% previously based on April numbers, but wage rates are still steady, meaning people are still getting paid well. People’s earnings are growing at an estimated 2.5% based on latest numbers, which means that inflation will kick in. At the moment the possibility of the US Federal Reserve raising interest rates will not likely happen in the next month or so but there is a strong possibility may happen by the year-end as inflation starts to tick up. This would cause an outflow of funds from emerging economies such as Malaysia and the ringgit would come under pressure. The fourth catalyst is also tied to the US. This time, it is the fear of Donald Trump becoming the next president. Trump prefers a strong dollar and has hinted of a haircut for those holding US dollar debt papers. Although Trump has come out to state that he was misquoted on the US dollar debt paper issue, it has spooked investors holding US$14 trillion of US debt papers. The markets will also watch with anxiety on how Trump deals with policies of other countries such as China, Japan and the European Union (EU) in weakening their currencies to boost the economy. As the run-up to the presidential elections takes place in November this year, if it becomes increasingly apparent that Trump will triumph over Hillary Clinton, then emerging markets will be spooked. And finally, the last possible catalyst to cause a global shock is the possibility of Britain leaving the EU or better known as Brexit. Increasingly, the chances of it happening are remote. Nevertheless, nobody can tell for sure until the referendum on June 23. All the five economic events will have a bearing on the ringgit. Everything points to the US dollar appreciating in the future, leaving the ringgit in defensive mode. This is already being reflected in the negative mood of the stock market. If there is less noise in the domestic economy on such matters relating to the handling of public funds to governance, it would help the case for the ringgit. The market is generally correct in predicting the future. But sometimes, the unexpected can happen – such as China handling its debt problems better than expected or Trump not being a candidate for the Republicans. Fortress Capital Asset Management director Geoffrey Ng at the 6th Annual Malaysia Roundtable: Pensions and Investments, Taking the Long View. Fortress Capital director Geoffrey Ng (pic) was previously CEO/executive director of Hong Leong Asset Management where he oversaw assets under management of US$1.8bil. He was previously senior vice-president, Global Emerging Markets with Dubai Investment Group with assets of US$2.2bil, as well as chief investment officer with Pacific Mutual Fund where he managed US$500mil in assets. Ng is currently a member of the CFA Institute’s Education Advisory Committee. He shares some insights on the market with StarBizWeek. The world is now undergoing slow growth. We’ve had 8 years of a bull market, low commodity prices, concerns on China, improving job data from the US and a prolonged environment of low interest rates. Under such circumstances, how do you view markets now? The “bull market” really has shown its horns only in countries and markets that have exhibited fundamental economic growth. Despite this, fund flows have been very selective. Take the Asia-Pacific region as a barometer, where despite decent general economic growth, the MSCI Asia-Pacific Index is at the same level as it was five years ago. The key question today is investors’ perception on the quality and sustainability of economic growth. Investors are praying for continued fiscal and monetary support for economic growth but not seeing enough private sector or consumption-led economic growth. Hence, broad equity markets are challenged to move higher since the quality of earnings from companies are susceptible to disappointment at this time. Without a macro trend in the market, we believe that good stock-picking is more important than ever. What are the main trends or changes you foresee happening in the economy over the next one-two years? For the Malaysian economy, almost two decades of government-led fiscal spending has resulted in a dependency on the public sector for growth as well as crowding out of private sector innovation and competitiveness. The government recognises this, which it is trying to rectify through greater focus on enabling SMEs and innovation. However, structural change in the private sector sometimes takes years, even decades to achieve. With historically high leverage in the federal government and in the average Malaysian household coupled with sluggish exports from a slowing global economy, it will be challenging to find a new source of growth that will be material to the economy. Hence, we expect a gradual decrease in the rate of GDP growth for Malaysia in the next couple of years unless commodity prices and/or exports recover quickly. And under those circumstances, are you buying more stocks now? We are maintaining our equity allocations, but focus heavily on individual stock-picking to generate outperformance. What is your investing strategy like now? How do you search for alpha when the bull market is already so matured? Yes, the “bull market” is mature, but the inherent volatility allows for alpha generating opportunities via stock selection and trading the “price range” of individual stocks. How do you spot trends ahead of their time? We don’t invest to spot trends, but search for fundamentally attractive companies that are mispriced and exhibit sustainability of operations and earnings. What other asset classes are you bullish on now besides equities? Any bearish views on any of the asset classes? We are not particularly bullish on any asset class at the moment, but prefer to identify securities within each asset class that we find attractive for our risk-adjusted return requirements. Having said that, the fixed income asset class continues to confound investors as interest rates in most parts of the world fall to levels not explained by economic or financial theory! In fact, investors’ search for higher returns and who remain focused on the fixed income asset class may be taking additional risks by allocating increasingly more of their capital to longer tenured or lower credit quality bonds – exposing them to surprises in the market such as changes in interest rate trends and deteriorating corporate or government financial health. We remain derisive of this asset class. On investing in newer companies, how do you choose winners? What are the red flags you sense in a company that may not do well? Newer companies that lack a public operating track record are assessed primarily on the sustainability and uniqueness of their business models, management quality and fundamental ability to generate cash flow and earnings growth. We expected the market to stage a technical rebound last week and we did see some rebound on Tuesday and the market rose for three days. However, the market declined steeply last Friday and led to a fourth weekly decline. Equity markets globally remained uncertain and investors opt for safer investment instruments like bonds. Weaker ringgit has also weakened market sentiment and foreign institutions continued to sell. The FBM KLCI declined 1.3 per cent in a week to 1,628.26 points on relatively higher trading volume. This indicates slightly stronger selling pressure. The average daily trading volume in the past one week rose from 1.6 billion shares to weeks ago to 1.8 billion. The average trading value increased from RM1.9 billion to RM2.1 billion. Foreign institutions continued to exit the market as ringgit weakens. Net selling from foreign institutions last week was RM1,004 million and net buying from local institution and local retail were RM904 million and RM100 million respectively. The Malaysian ringgit weakened from RM4.40 to a US dollar to RM6.03 in a week. In the FBM KLCI, decliners out-paced gainers 17 to 11. The top gainers for the week were Astro (M) Holdings Bhd (4.5 per cent in a week to RM2.80), British American Tobacco (M) Bhd (4.2 per cent to RM48.98) and YTL Corporation Bhd (1.9 per cent to RM1.60). The top decliners were MISC Bhd (10.8 per cent to RM7.44), CIMB Group Holdings Bhd (5.6 per cent to RM4.40) and UMW Holdings Bhd (4.4 per cent to RM6.03). Markets performances in Asia were mixed. China’s Shanghai Stock Exchange Composite index fell 2.9 per cent in a week to 2,827.37 points last Friday. Hong Kong’s Hang Seng Index declined 1.9 per cent in a week to 19,719.29 points and Singapore’s Straits Times closed marginally higher at 2,734.91 points. The Nikkei 225 index increased 1.9 per cent in a week to 16,412.21 points. The US and European markets were also mixed. The US Dow Jones Industrial Average increased only 0.3 per cent in a week to 17,720.5 points last Thursday. Germany’s DAX Index increased 0.1 per cent in a week to 9,862.12 points and London’s FTSE100 declined 0.2 per cent to 6,104.19 points Thursday. The US dollar continued to strengthen against major currencies. The US dollar index futures increased from 93.8 points last week to 94.1 points. Crude oil pulled back for a correction after hitting a 6-month high two weeks ago. US Crude oil (WTI) increased 4.3 per cent in a week to US$46.39 per barrel, the highest in six months. COMEX Gold declined 1.2 per cent in a week to US$1,264.70 an ounce. Crude palm oil in Bursa Malaysia declined 1.7 per cent in a week to RM2,586 per metric tonne on higher than expected palm oil output in April. The FBM KLCI failed to rebound as expected despite indicators showing that the index is oversold. The index remained bearish below the short and long term 30 and 200 day moving averages. Furthermore, the index is below the Ichimoku Cloud indicator. The cloud is wide until two weeks and this indicates that the market may continue to face resistance. Momentum indicators increased last week and this indicators weaker bearish momentum. However, indicators like RSI and Momentum Oscillator are still below their middle levels and this indicates that the bears are still in control. Furthermore, the index is trading near the bottom band of the Bollinger bands indicator and the MACD indicator below its moving average. The market may be oversold as technically indicate but sentiment remain bearish. The market rebounded but was very weak and this indicates the selling in May is not over. Markets globally continued to be uncertain and this weakened confidence further. Weakening ringgit added salt to the wound. After a weak performance last week, we expect the market to continue its bearish trend. Immediate support level is at 1,614 points but this is expected to be broken and the index to fall to the next support level at 1,600 points. The above commentary is solely used for educational purposes and is the contributor’s point of view using technical al analysis. The commentary should not be construed as an investment advice or any form of recommendation. The short-and intermediate-term trends are now bearish for Malaysia. Selling by foreign investors reaches highest level in almost three years, in anticipation of cut in Malaysia's weightage in key Morgan Stanley index. KUALA LUMPUR: Bursa Malaysia suffered a third consecutive week of net selling by foreign investors last week, the MIDF Amanah Investment Bank Bhd said in its fund flow report, released today. MIDF stated that last week foreign investors bought RM2.16 billion worth of shares but this was negated by the selling of RM3.17 billion worth of shares, putting the net selling value of shares beyond RM1 billion. “Foreign selling on Bursa continued for the third consecutive week and surged to its highest level this year,” MIDF said, adding that the Bursa had also recorded its worse single-day record of foreign selling since Aug 28, 2013. “The killer blow came last Friday, when foreigners dumped RM657.6 million, the highest attrition in a single day since 28 August 2013, when RM901.2 million exited local equity,” MIDF said. For the previous two weeks – week ending May 6 and week ending April 29 – the foreign net selling recorded RM622.7 million and RM430.8 million, respectively. The report added that foreigners were net sellers every single day last week. The continued surge in the foreign net selling of shares on Bursa, is said to be in anticipation of the cut of Malaysia’s weightage in the Morgan Stanley Composite Index (MSCI). It was reported previously that the weightage of Malaysian shares in the MSCI Emerging Market Index may be reduced from 3.43% to 3.09%. China’s investment forays into Southeast Asia, even as it presses on with its South China Sea reclamation works are well-known. But recent acquisitions in Malaysia have taken on an unusually high profile in a country with race relations in a delicate state, and where the Chinese are a significant minority. In the space of less than two months, China has bought two multi-billion-dollar strategic assets from Malaysia’s debt-laden state-owned investment firm, 1Malaysia Development Berhad (IMDB), expanding its influence in the country while throwing a lifeline to embattled Prime Minister Najib Razak. The investments, analysts said, have geopolitical implications - specifically, regarding territorial disputes in the South China Sea where Malaysia has an overlapping claim with China. “Najib’s, and Malaysia’s, ability to manoeuvre, vis-à-vis China, is going to be limited after this deal. How far we [Malaysia] will be able to pursue an independent foreign policy after this, is going to be one of the key questions,” said Dennis Ignatius, a former Malaysian diplomat who has served in Beijing, Washington and London. Najib chairs the advisory board of 1MDB which racked up RM42 billion ringgit (US$9.6 billion) in debts in less than five years and almost defaulted on a loan. For months, 1MDB’s troubles weighed on Malaysia’s sovereign credit rating. It led to calls for Najib’s resignation from former prime minister Dr Mahathir Mohamad and opposition parties, who accused Najib of mismanagement and corruption. 1MDB is currently under investigation by five domestic agencies and authorities in Switzerland. Najib has denied any wrongdoing. “China’s successful bid for 1MDB’s power assets and property projects have helped 1MDB decrease its debt burden and resolve 1MDB indebtedness,” said Yeah Kim Leng, Dean of the School of Business at the Malaysia University of Science and Technology. “The assets were sold to the highest bidder. 1MDB got a good price,” Yeah added. In his 2016 New Year’s Day address, Najib said 1MDB’s debts have now been reduced by RM40.4 billion following the rationalisation of its assets. China General Nuclear Power Corp, a Chinese state-owned enterprise, paid US$2.3 billion to acquire 1MDB’s Edra Global Energy Bhd last November. Edra is the country’s second largest power producer, giving China a major foothold into the energy sector. In December, China Railway Construction Corp teamed up with Malaysian Iskandar Waterfront Holdings Sdn (IWH) to buy a 60 per cent stake in 1MDB’s property project known as Bandar Malaysia for US$1.7 billion in a 40:60 joint venture. Bandar Malaysia is a mixed-property project on a 196.7-hectare site. The development will also host terminals for a planned Singapore-Kuala Lumpur high-speed rail link. Analysts said China was now in pole position to win the construction tender for the rail link, one of the country’s largest pending infrastructure projects, with an estimated cost of RM70 billion. The 1MDB acquisitions made China Malaysia’s largest foreign investor in 2015, leapfrogging the US, Japan, EU and Singapore. Ironically, China’s acquisitions come at a time when Najib’s ruling Umno party has ratcheted up anti-Chinese rhetoric, accusing the ethnic minority of trying to usurp political power from the Malay majority. The rhetoric surged after a rally for good governance last August drew tens of thousands of people, among whom the majority were Chinese. UMNO supporters responded by holding an overtly anti-Chinese “red-shirt” protest that drew 35,000 people. In a sign of its growing influence and confidence in its ability to withstand any blowback on bilateral relations, China’s ambassador to Kuala Lumpur, Huang Huikang waded into the controversy during a visit to the capital’s Chinatown after the red shirt rally. “China rejects any form of extremism and racism, and will not stand by if Chinese interests are at stake,” he said at the height of the tensions, in remarks that raised eyebrows in diplomatic circles. UMNO’s youth division accused Huang of interfering in Malaysia’s domestic affairs, and Huang was summoned by the Malaysian Foreign Ministry to explain his remarks. Given this backdrop, the response from the Malay majority to China’s purchase of the country’s strategic assets has been surprisingly muted. “His [Najib’s] supporters hardly pay attention to geopolitical issues because that is too complicated for them. That is why China’s advances into this region hardly register in their radar and no one asks about the impacts of China’s investment into the country’s strategic assets,” said Wan Saiful Wan Jan, chief executive of the Institute for Democracy and Economic Affairs. According to Wan Saiful, the anti-Chinese rhetoric from Umno has been getting stronger lately as Najib feels compelled to shore up support from his core Malay voters. “So he dangles the racial card and he does not care the repercussion to the country’s harmony. The more divided Malaysia is, the more likely that Najib will remain in power because Umno has always benefitted from a divide-and-rule strategy,” said Wan Saiful. Ignatius, the former Malaysian diplomat, said China’s behaviour needed to be watched as its investments increased in the country. “Malaysia is….very open to foreign investment so there’s no intrinsic problem with foreign investment, whether from China or elsewhere. Problems could arise, however, when countries seek to use their investments to exert undue influence over the direction of the country’s affairs,” Ignatius said. Ignatius said it was also important for China to be mindful of race relations in Malaysia. “Given Malaysia’s ethnic mix, China will also have to be wary not to get drawn into the whole complex and contentious area of race relations. If China is perceived as showing favouritism to Malaysian Chinese, it would certainly create resentment among the Malays. It would, therefore, have to carefully balance its relations with both communities,” said Ignatius. “As well…if China is seen to be using its economic and political clout to buttress a government that is increasingly unpopular, which it now seems to be doing for its own reasons, that also won’t go down well with those of us who want to see more democratic space in Malaysia,” Ignatius said. China’s investments reflected Malaysia’s importance as a linkage point for China’s One Road, One Belt (Obor) initiative, according to Alexious Lee, Head of Industrial Research, China, CLSA Ltd.
“When we talk about Obor, we usually look at two regions, Southeast Asia and Central Asia,” said Lee. According to Lee, Malaysia was important as a point which connects Thailand with Singapore, given its position between the two countries. The current volatility in China, amid wild swings in the stock market and an economic slowdown, only serves to accelerate the country’s overseas investments. Malaysia's central bank is proposing new rules to raise governance standards in the boards of financial institutions, a move that financial executives said could have wide implications for top state-controlled banks CIMB Holdings and Malayan Banking (Maybank). The little-noticed proposed guidelines, which were issued to banks in mid-March and widely expected to be adopted in the coming weeks, will prohibit a former chief executive of a financial institution from taking over as chairman of the board of directors. The proposed rules from Bank Negara Malaysia also stipulate that these institutions must have a majority of independent directors on their respective boards. "The thrust of the new rules is to protect the objectivity of the chairman and to clearly lay out the separation between the board and management," a Bank Negara official told The Straits Times. The official added that the central bank wants to avoid situations where a "chairman could be in a position to oversee policies that were put in place when that person was CEO. "The whole idea behind this is to avoid self-oversight." Financial industry executives say the new measures could have an impact on prominent banker Nazir Razak of CIMB. Datuk Seri Nazir, the younger brother of Prime Minister Najib Razak, served as CIMB's CEO between 1999 and 2014 before taking over as chairman. He recently took leave of absence from CIMB, pending a review by the bank on his role in disbursing more than US$7 million (S$9.6 million) in political funds that Datuk Seri Najib asked him to distribute ahead of Malaysia's general election in 2013. A senior CIMB executive told The Straits Times that the bank is aware of the proposed guidelines and noted that it will consider the impact of the proposed guidelines on Mr Nazir's position only when "they become a ruling". Mr Nazir declined comment, noting that he wanted the bank's review to run its course. The planned guidelines could also have implications at state-controlled Maybank, Malaysia's largest lender. Government sources said Mr Najib is considering appointing Mr Abdul Wahid Omar, the minister in the Prime Minister's Department in charge of economic planning, as the chairman of Maybank when Datuk Seri Abdul Wahid steps down from the Cabinet early next month. Mr Abdul Wahid was Maybank's president and CEO between 2008 and 2013. Once the new guidelines are in place, Mr Abdul Wahid cannot become Maybank's chairman. The new guidelines were highlighted in a so-called concept paper Bank Negara issued in mid-March. These papers are typically issued to give financial institutions advance notice on proposed changes to regulations and to invite industry feedback. It is not clear whether the new rules are in response to fallout from the unfolding financial fiasco at state-owned 1Malaysia Development Berhad (1MDB), which has ensnared several Malaysian banks. Bank Negara last September surprised many people by penalising Abu Dhabi's Aabar Investment PJS, which owns a 21.09 per cent interest in RHB Capital, Malaysia's fourth-largest lender. The central bank capped Aabar's voting rights in RHB Capital to 15 per cent despite Aabar's much larger equity holdings. Government officials said the move deeply upset the Abu Dhabi sovereign fund, which was playing a central role in guaranteeing much of 1MDB's international debt. 1MDB and Abu Dhabi's sovereign wealth funds, including Aabar and IPIC, are now locked in a bitter dispute involving billions of dollars in missing funds. The 1MDB fallout also hit AMMB Holdings (AmBank Group), a mid-sized financial institution that emerged as an intermediary in the flow of funds into PM Najib's banking accounts. Last November, Bank Negara issued a RM53.7 million (S$18.3 million) fine to Ambank Group for breaching undisclosed regulations. Officials said the penalty was directly tied to the 1MDB affair. And CIMB's Mr Nazir became enmeshed in the 1MDB scandal after admitting that he disbursed political funds from Mr Najib's personal account to politicians and groups ahead of the 2013 polls. KUALA LUMPUR, Malaysia — Malaysia’s billion-dollar political scandal claimed another casualty on Monday when the prominent banker Nazir Razak announced that he would temporarily step aside while his bank examined his handling of nearly $7 million he received from his brother, Prime Minister Najib Razak. Mr. Nazir said he would take a leave of absence from his positions as chairman and director of CIMB Group Holdings after acknowledging that he took the money from his brother and distributed it, as he was instructed, to governing party figures before national elections in 2013. “I acted based on what I knew at that time,” he said. Mr. Nazir’s decision to step aside voluntarily while the bank conducted an internal review is likely to focus attention on the refusal of Mr. Najib to step down over more serious allegations, including that he deposited more than $1 billion in questionable funds into his personal bank accounts. News reports have charged that much of the money the prime minister deposited came from a government investment fund that he oversees, the 1Malaysia Development Berhad, commonly known as 1MDB. Mr. Najib denies any wrongdoing and has resisted all calls to give up his post. 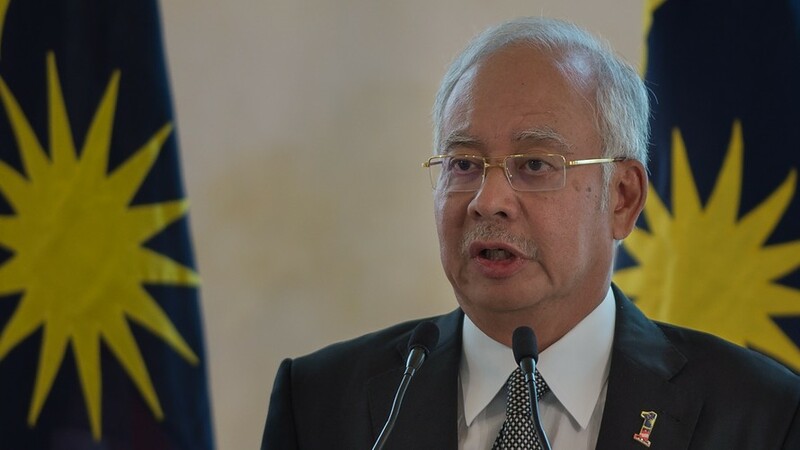 The prime minister has, however, removed officials who were critical of his actions, including an attorney general, Abdul Gani Patail, and a deputy prime minister, Muhyiddin Yassin. Mr. Najib’s office declined to comment on Monday about Mr. Nazir’s decision to take a leave of absence, saying it was a matter for CIMB. Mr. Nazir, who at times has been critical of the 1MDB fund, which was created under his brother, was drawn into the scandal last month after The Wall Street Journal reported that he had received the $7 million from the prime minister and distributed it to governing party leaders. 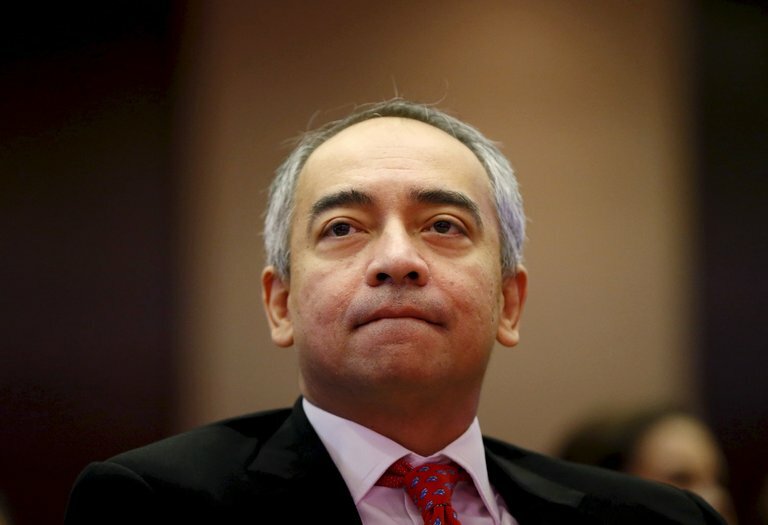 Mr. Nazir said on Monday that he accepted the money after determining that the transactions would not violate any law and that he would not be abusing his position at CIMB. But once the unusual transfers became public, he said, he recognized that it was “a cause of concern” and that he should step aside to safeguard the bank’s integrity. CIMB, which began the review on April 5, expects it to be completed in a few weeks, according to a statement issued by the bank. The multinational audit firm Ernst & Young will assist. Mr. Wan Saiful, the analyst, said that Mr. Nazir’s willingness to step aside while he was being investigated was a rare step for a public figure in Malaysia and showed his confidence that he would be exonerated of any banking violations. Mr. Wan Saiful also said it was clear Mr. Nazir had not broken campaign finance laws because Malaysia did not regulate such funding. KUALA LUMPUR, May 21 — Bursa Malaysia is expected to trend lower next week given the cautious and softer tone in being influenced by the US stock markets, said analyst. “Given the weak technicals, we also continue to believe the FTSE Bursa Malaysia KLCI is yet to bottom-basing and could stage further weakness if the ringgit and commodities continue to fall,” said Affin Hwang Investment Bank Vice-President and Retail Research Head, Datuk Dr Nazri Khan Adam Khan. Bottom basing is an example of a current sideways price pattern that is becoming a common bottom. The big focus in global stock markets is the shift in expectations that US interest rates could rise earlier than previously expected. The minutes from the Federal Reserve’s April policy meeting made it clear that a June increase remained firmly on the cards, he told Bernama. He said on the domestic front, three major headlines are likely to cushion market weakness. “Malaysia’s balance of payments for the first quarter, which showed the current account surplus had narrowed to RM5.0 billion or 1.7 per cent of gross domestic product (GDP) after rising in the previous quarter to RM10.5 billion or 3.5 per cent of it. “Then, Bank Negara Malaysia’s action of maintaining the overnight policy rate at 3.25 per cent, meeting market expectations and sending accommodative signals to support economic activity. “Thirdly, the government announced that Malaysia would remain in the Trans-Pacific Partnership Agreement (TPPA) and is set to complete the domestic ratification process for it by mid-2017. “The announcement should catalyse exporters stocks which benefit strongly from the conclusion of the TPPA,” he added. On a weekly basis, the benchmark FTSE Bursa Malaysia KLCI (FBM KLCI) gained 0.53 of-a-point to 1,628.79 from 1,628.26 last week. The FBM Emas Index added 7.83 points to 11,409.72, the FBMT100 Index rose 9.17 points to 11,099.39 and the FBM Emas Shariah Index was 24.24 points higher at 11,930.02. On a sectoral basis, the Finance Index fell 56.71 points to 14,248.32, the Plantation Index edged upward 7.19 points to 7,462.65 and the Industrial Index improved 37.88 points to 3,068.37. Weekly turnover decreased to 8.41 billion units valued at RM8.85 billion from 8.86 billion units worth RM10.10 billion last Friday. Main market volume fell to 5.34 billion units valued at RM8.23 billion versus 5.46 billion units worth RM9.43 billion. Warrant turnover declined to 628.75 million units valued at RM94.24 million against 824.67 million units worth RM107.92 million. The market seems to be directionless in the past one week and I mentioned that the bears are still in control. However, there is still some support as the FBM KLCI was held firm from last week. Foreign institutions continued to sell on weak ringgit. The FBM KLCI closed almost unchanged at 1,628.79 points after trading in a range between 1,611.91 and 1,637.37 points. The average daily trading volume in the past one was firm at 1.8 billion shares as compared to its previous week. The average trading value declined from RM2.1 billion to RM1.9 billion, an indication of more lower-capped stocks being traded. Foreign institutions continued to exit the market as ringgit weakens. Net selling from foreign institutions last week was RM1.16 billion and net buying from local institutions was RM1.18 million. Local retail was net seller at RM0.02 billion. The Malaysian ringgit weakened from RM4.03 to a US dollar to RM4.07 in a week. In the FBM KLCI, decliners marginally led gainers eight to seven. The top gainers for the week were Petronas Chemicals Group Bhd (3.2 per cent in a week to RM6.40), Petronas Dagangan Bhd (3.1 per cent to RM23.40) and Sapurakencana Petroleum Bhd (2.5 per cent to RM1.62). The top decliners were UMW Holdings Bhd (5.5 per cent to RM5.70), Axiata Group Bhd (2.2 per cent to RM5.41) and Astro Malaysia Holdings Bhd (2.1 per cent to RM2.74). Markets were slightly bullish led by Japan. China’s Shanghai Stock Exchange Composite declined marginally to 2,825.94 points last Friday. Hong Kong’s Hang Seng Index rose 0.7 per cent in a week to 19,852.19 points and Singapore’s Straits Times increased 0.1 per cent to 2,763.82 points. The Nikkei 225 index increased two per cent in a week to 16,736.35 points 16,412.21 points. The US and European markets were mixed. The US Dow Jones Industrial Average declined 0.2 per cent in a week to 17,500.94 points last Friday. Germany’s DAX Index fell 0.4 per cent in a week to 9,916.02 points and London’s FTSE100 rose 0.3 per cent to 6,156.32 points. The US dollar index futures increased from 94.6 points last week to 95.3 points. Crude oil continued to climb to fresh six-month highs. US Crude oil (WTI) increased 4.5 per cent in a week to US$48.48 per barrel. However, COMEX Gold declined 1.7 per cent in a week to US$1,252.90 an ounce. Crude palm oil in Bursa Malaysia fell 2.3 per cent in a week to RM2,527 per metric tonne. 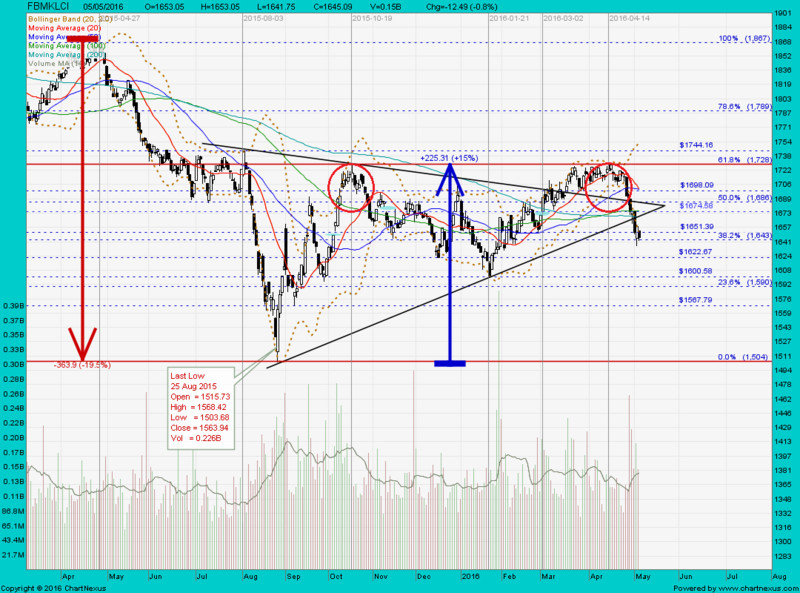 Technically, the FBM KLCI remained bearish below both the short and long term 30 and 200 day moving averages. The index is also below the Ichimoku Cloud indicator and the widening cloud indicates that there is still strong resistance. The Cloud only shrinks in two weeks time and based on this indicator, this is when the resistance turns weak. Momentum indicators are still bearish but are beginning to show a bullish divergence. For the past two weeks, the RSI has found support and started to slightly increase. The MACD indicator is about to cross above its moving average. The Bollinger Bands continued to contract but the FBM KLCI is now moving towards its mid-band, and indication of a weak bearish trend. There is still no reversal despite the FBM KLCI showing that the market is technically oversold. There was support in the past two weeks despite selling pressure but was weak as the market lacked confidence. Chart-wise, there were no clear reversal indications. After four weeks of declines, the FBM KLCI finally held firm and on the weekly chart, it formed a “doji” Japanese candlesticks chart pattern. This indicates uncertainty. Therefore, there are still no signs of reversal and the only indication we can get is that the bearish trend is weak. However, the candlesticks pattern can turn into a “Morning Star” chart pattern if the FBM KLCI close higher this week. This pattern is a bullish reversal pattern. PETALING JAYA: Foreign selling on Bursa Malaysia Securities Bhd continued for the fourth consecutive week and surpassed the prior week’s year-to-date high. The net amount offloaded by foreign investors edged up to RM1.16 billion from RM1 billion the week before. In its fund flow report, MIDF Research said it was the first time foreigners sold over RM1 billion for two consecutive weeks since August 2015, based on transactions in the open market, which excluded off market deals. Foreigners were net sellers every single day last week. As of Friday, foreign investors had been selling in 17 out of 18 straight days. “We note that daily selling has been consistently at over RM100 million. Prior week’s selling momentum was carried forward into last week. The week-long biggest attrition of RM307.3 million occurred on Monday. It was also the second highest daily attrition year-to-date,” said the research house. It added that selling pressure subsided slightly to RM132.7 million on Tuesday. The pace, however, picked up again on Wednesday with selling of RM198 million, and RM296.4 million on the following day. Foreigners ended the week with selling of RM223.8 million on Friday. It said foreign participation rate edged down by 6.0% compared to the prior week as it has narrowed by RM64.8 million, to RM1 billion. Nonetheless, that was its third consecutive week staying at over RM1 billion. Daily total foreign trade has been high on Wednesday and Thursday which amounted to RM1.19 billion and RM1.16 billion respectively. Local institution continued to support the market, mopping up RM1.18 billion. However, its participation rate declined to RM1.95 billion, the lowest since March this year. Retail buyers, for the first time in four weeks, turned net sellers by offloading RM21.2 million, with a participation rate of RM583.7 million. KUALA LUMPUR: Foreign selling is soaring in Asia, no exception for Bursa Malaysia, sending equity prices on a downward trend regionally due to the reverse of the fund flow ahead of the US Federal Reserve’s decision on its interest rate in mid-June. The continued foreign selling has weighed down the FBM KLCI, which has been on the decline since April 25. Over the past month, the FBM KLCI had fallen as much as 93.3 points or 5.44% to a low of 1,621.21 points last Monday from 1,714.51 points on April 25. The benchmark index closed at 1,634.89 points yesterday, down 3.4% year to date (YTD). The ringgit had depreciated 4.47% against the US dollar between April 25 and May 16 from 3.9075 to 4.0273. The ringgit closed at 4.0825 against the greenback yesterday. Foreign selling continued for the fourth consecutive week and surpassed the prior week’s YTD high on Bursa, according to MIDF Research. MIDF Research head Zulkifli Hamzah said regionally global liquidity continued to flow out of Asia last week; investors classified as “foreign” offloaded up to US$990 million equities as the intensifying debate of a US Fed June hike has been dampening global investors’ appetite for Asian stocks in general. In the weekly fund flow report yesterday, Zulkifli said the net amount offloaded by foreign investors edged up to RM1.158 billion from RM1.004 billion the week before. He said it was the first time foreigners sold more than RM1 billion for two consecutive weeks since August 2015, based on transactions in the open market which excluded off-market deals. “Foreigners were net sellers every single day last week. As of [last] Friday, foreign investors had been selling in 17 out of 18 straight days. “We note that daily selling has been consistently more than RM100 million. The prior week’s selling momentum was carried forward into last week,” he said. He said last week’s foreign withdrawal further reduced the cumulative net foreign inflow into shares listed on Bursa to an estimated RM3.19 billion so far this year, down from the prior week’s RM4.35 billion. Nonetheless, he noted that the amount is still modest relative to the RM19.5 billion and RM6.9 billion net outflows in 2015 and 2014 respectively. Zulkifli said the foreign participation rate edged down 6% compared with the prior week as it has narrowed by RM64.8 million to RM1 billion. Nonetheless, he said that was its third consecutive week staying at over RM1 billion. “Daily total foreign trade has been high on [last] Wednesday and [last] Thursday, which amounted to RM1.19 billion and RM1.16 billion respectively. “Local institutions continued to support the market, mopping up RM1.179 billion. However, their participation rate declined to RM1.95 billion, the lowest since March this year,” he said. He said retail buyers, for the first time in four weeks, turned net sellers by offloading RM21.2 million. Malaysia's 681.7 billion ringgit ($168.5 billion) Employees Provident Fund, Kuala Lumpur, reported Tuesday that investment income for the quarter ended March 31 dropped 36% from quarter ended March 31, 2015, reflecting weak equity market conditions globally and a stronger local currency that weighed on the value of the fund's overseas holdings. That value of the total EPF portfolio was down 0.4% from three months earlier, but up 2.7% from a year earlier. Shahril Ridza Ridzuan, CEO of the fund, said in a news release that the investment climate for the latest quarter had deteriorated from the year before, when better returns on the fund's global investments, “particularly in developed equity markets,” compensated for a weak local market. With the ringgit strengthening 10% over the quarter, the EPF's overseas assets — accounting for roughly a quarter of the overall portfolio — saw their contribution to the quarter's investment income of 6.78 billion ringgit plunge to 22% from 47% for the year-earlier quarter, Mr. Shahril said. Domestic and foreign equities accounted for 41.4% of overall assets but contributed only 37.6%, or 2.55 billion ringgit, of overall investment income. For the first quarter of 2015, equities had accounted for 60% of a 10.6 billion ringgit investment income pie. The value of the fund's equity holdings, meanwhile, dropped to 282.41 billion ringgit, down 5.8% from the prior quarter while slipping 0.8% from the year-earlier quarter. Fixed income, composed of Malaysian government securities, loans and bonds, accounted for 51.7% of the portfolio, and 55.2% of the quarter's investment income, or 3.74 billion ringgit. Money market funds amounted to 22.6 billion ringgit, and contributed 110 million ringgit in income. The fund's investments in real estate and infrastructure came to 3.5% of the portfolio, and contributed 5.6% to income for the latest quarter. Mr. Shahril said the EPF will look for opportunities to add allocations to those market segments, with the ultimate goal of boosting their weight in the portfolio to 10% within five to seven years. KUALA LUMPUR: Malaysian palm oil futures hit their lowest level in nearly three months on Monday, dragged down by losses in Chinese vegetable oils, while a stronger ringgit also weighed on sentiment earlier in the day. The palm oil contract for August delivery on the Bursa Malaysia Derivatives Exchange had fallen 1.4 percent to 2,492 ringgit ($610) per tonne by the closing trade, posting its third loss in the past four sessions. Earlier in the day, the contract fell as much as 2.1 percent to 2,475 ringgit, its lowest since March 3. Last week, palm posted its second consecutive weekly decline, weighed down by the sell-off in Chinese commodities markets. Traded volumes stood at 52,089 lots of 25 tonnes each on Monday evening compared with the 2015 daily average of 44,600. "Palm is kept down by external markets, Dalian's RBD (refined, bleached and deodorized) palm olein has continuously been under pressure," said a trader based in Kuala Lumpur. The most actively traded September contract for palm olein on the Dalian Commodity Exchange dropped 2.2 percent on Monday. The ringgit rose on Monday morning before falling slightly by 0.2 percent to 4.0840 per dollar. A stronger ringgit make palm more expensive for holders of foreign currencies. In other vegetable oils, the Chicago Board of Trade soyoil contract for August fell 0.8 percent, while the September soybean oil contract on the Dalian Commodity Exchange dropped 2.4 percent. The offer price for crude palm kernel oil stood at 4,828 ringgit per tonne in the evening, according to price assessments by Thomson Reuters. FBMKLCI closed @ 1645.09 (-12.49, -0.8%) on 5 May 2016. However, the FBM KLCI may fall to 1,600 points if the index fails to climb higher this week as the trend is still bearish. Representatives from regulatory and enforcement agencies including the Public Accounts Committee (PAC) should be sent to Singapore and Switzerland, to learn how they could detect money-laundering and corrupt practices involving billions of ringgit linked to 1MDB which had escaped Malaysian authorities. This, argued DAP supremo Lim Kit Siang, is necessary as the 1MDB special task force comprised of Bank Negara, the Malaysian Anti-Corruption Commission (MACC), police and Attorney-General’s Chambers should be resurrected to redeem the country's integrity in the wake of international actions over the matter. "It is a supreme insult and blow to the credibility, capability, professionalism, integrity and authority of the Malaysian investigative and enforcement authorities," said Lim in a statement, that foreign agencies could see what ours could not. "The Swiss Financial Market Supervisory Authority (Finma) could order the closure of BSI Bank for failure to monitor 1MDB funds to prevent money laundering and corrupt practices, but its Malaysian counterparts are blissfully ignorant of such serious money-laundering malpractices." Lim opined that while we may be at the "end game" of the 1MDB global scandal, it is likely to be prolonged and protracted, which is not the end of the 1MDB saga, but the beginning of another chapter. The crackdown in Singapore and Switzerland, said Lim, may just be the tip of the iceberg as other regulatory and enforcement agencies around the world are also zeroing in on banks and companies linked to 1MDB deals and monetary transfers. "What concerns Malaysians is whether the Malaysian investigative and enforcement authorities, namely Bank Negara, MACC, police, the AG’s Chambers as well as the PAC could redeem themselves and restore national and international confidence in their credibility," he concluded. 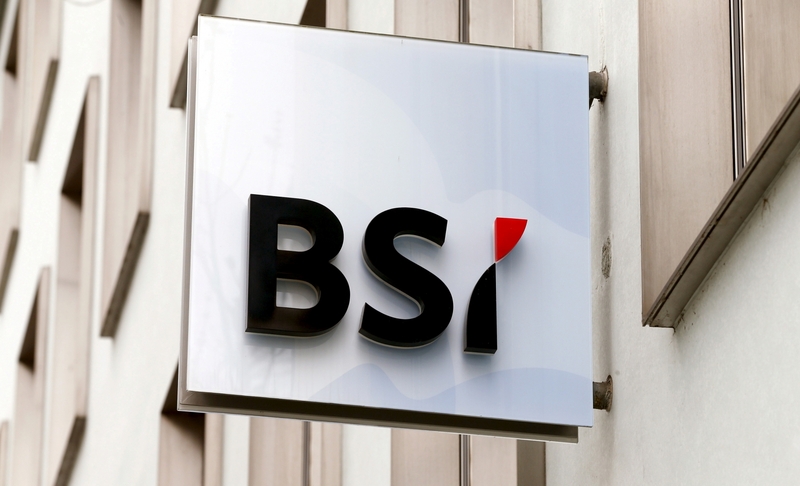 Earlier this week Singapore and Swiss regulatory authorities swooped in on BSI over its alleged involvement in activities that breach money laundering guidelines and ignored compliance oversight, linked to 1MDB funds. Singapore had ordered BSI to close its local branch after withdrawing the bank's merchant banking license, the first time the island nation did so in 32 years, and referred the financial institution's top six officials for charges. While the Swiss authorities had ordered 143-year old bank to be closed down and absorbed totally by a rival private bank. 1MDB has denied wrongdoing but says that it stands ready to cooperate with international probes though claimed that no one from foreign jurisdictions had contacted it as yet. Prime Minister Najib Abdul Razak who chairs 1MDB's advisory board also denied that there are irregularities in the fund's financial books and administration, claiming that the only problem is with weaknesses in management that the government had blamed on an ex-CEO and his team. Singapore's regulators have shut down a private bank implicated in investigations of Malaysia's troubled development fund 1MDB, with prosecutors in the city-state and Switzerland weighing criminal charges. The Monetary Authority of Singapore (MAS) said Switzerland-based BSI Bank would lose its status as a merchant bank in Singapore due to "serious breaches of anti-money laundering requirements, poor management oversight of the bank's operations, and gross misconduct by some of the bank's staff." "BSI Bank is the worst case of control lapses and gross misconduct that we have seen in the Singapore financial sector. It is a stark reminder to all financial institutions to take their anti-money laundering responsibilities seriously," Ravi Menon, managing director of MAS, said in the statement. This is the first time since 1984 that MAS has withdrawn a merchant bank's approval. The central bank's criticism of BSI was harsh and wide-ranging. In its statement, MAS said the bank had an "unacceptable risk culture, with blatant disregard for compliance and control requirements as well as MAS regulations." MAS accused several bank staff of making material misrepresentations to auditors and abetting improper valuations of assets. The central bank said it had referred six members of BSI's senior management to the public prosecutor in order to evaluate whether they had committed criminal offences. "MAS found considerable evidence of gross dereliction of duty and failure to discharge oversight responsibilities on the part of BSI Bank's senior management. Their ineffective governance led to a poor risk culture, which prioritized questionable customer demands ahead of compliance with anti-money laundering regulations and the bank's own internal controls," MAS said. At the same time, Switzerland's Office of the Attorney General said it had opened criminal proceedings against BSI SA Bank, based on information uncovered by a Swiss criminal investigation into 1 Malaysia Development Berhad, adding that the bank's governance deficiencies had made rendered BSI unable to prevent the offenses under investigation related to the debt-ridden Malaysian development fund. Former employees at BSI in Singapore have been named in various reports as having handled transactions for 1MDB, and although the Singaporean regulator did not refer directly to 1MDB in its statement, BSI Bank in Switzerland issued a statement in which it said it had ooperated with both Swiss and Singapore regulators in their investigations into the troubled wealth fund. BSI also said its Group CEO Stefano Coduri had stepped down with immediate effect. Coduri had been in the role since 2012. "The board of directors thanks Stefano Coduri's for his sense of responsibility and accepts his resignation," the statement said. One of the BSI bankers named in the MAS statement, Yak Yew Chee, a former senior private banker, already faces a criminal probe in Singapore. Yak, who left the bank in March, filed an affidavit with the Singapore High Court earlier this year denying any wrongdoing or receiving unlawful benefits from managing 1MDB accounts, according to a Reuters report. Another of the names the MAS said on Tuesday it had referred to prosecutors, former BSI Bank wealth planner Yeo Jiawei, has reportedly been served with seven charges related to the 1MDB probe, including receiving benefits from criminal conduct, forgery and money laundering. The forgery charge was related to Yeo allegedly signing a reference letter to another bank's compliance chief in order to help faciliatate a fund transfer. Yeo has also been accused of asking another person named in the MAS statement on Tuesday, Kevin Michael Swampillai, BSI's head of wealth management services, to lie to police about a fund transfer. A lawyer for Swampillai declined to comment. A lawyer for Yeo did not immediately return an emailed request for comment. 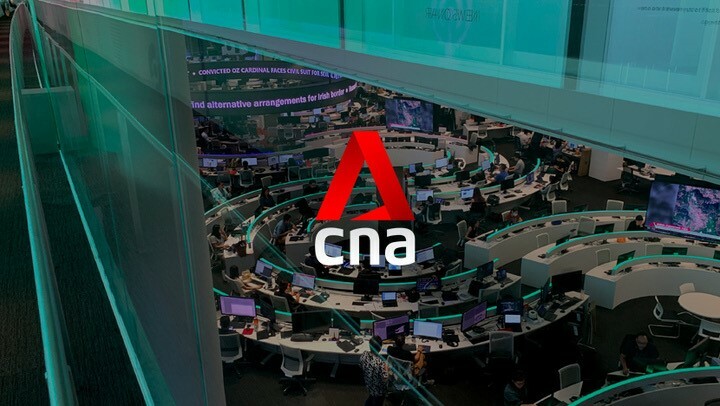 Two others named in the MAS statement, Hans Peter Brunner, the Singapore unit's former CEO, and Raj Sriram, the former deputy CEO, did not immediately return LinkedIn messages sent requesting comment. No contact details could be found for Seah Yew Foong Yvonne, a former senior private banker at BIS, who was the sixth person named in the MAS statement as having been referred for potential prosecution. Questions about movement of funds from 1MDB gained attention in July, when the Wall Street Journal reported that in 2013 nearly $700 million had flowed from the fund to Malaysian Prime Minister Najib Razak's personal bank account. Najib has repeatedly denied wrongdoing and, under pressure from the outcry caused by the WSJ report, said the funds were a private donation from a Middle Eastern country he declined to name. He has denied benefiting personally from any of the funds. In January, Malaysia's Attorney General Mohamed Apandi Ali said that Saudi Arabia's royal family gave Najib a $681 million gift, of which Apandi said about $600 million was later returned. Apandi said that no criminal offense had been committed. But globally, investigations into 1MDB in locales as varied as U.S., Switzerland, Singapore and the Seychelles have continued. The WSJ has reported that funds filtered from 1MDB financed Red Granite Pictures, a film production company co-founded by Najib's stepson Riza Aziz, which produced the film the Wolf of Wall Street. The WSJ has also reported tha Riza used at least $50 million from 1MDB to purchase luxury properties in London, Los Angeles and New York. The WSJ said Riza had denied any wrongdoing. In an emailed comment, Red Granite noted that it has received hundreds of millions in funding over the past six years from multiple sources, including U.S. commercial and investment banks, while generating nearly $1 billion in box office receipts. "To its knowledge, none of the funding received by Red Granite was in any way irregular or illegitimate," the email said. "Red Granite is cooperating fully with all inquiries and is confident that when the facts come out, it will be clear that neither Riza Aziz nor Red Granite has done anything wrong." The latest twists and turns in Malaysian politics are not fully priced in, analysts from the National Australia Bank warn. The Malaysian ringgit has been one of the best-performing currencies in Asia so far this year, but some analysts think the rally may be short-lived. Year to date, the ringgit gained 5 per cent against the US dollar to trade at 4.0400 early Friday (Mar 18), according to Bloomberg data, despite the protracted scandal surrounding Prime Minister Najib Razak and state investment fund 1MDB. Only the Japanese yen and the Indonesian rupiah have clocked in stronger gains, rising 5.4 and 5.9 per cent against the greenback respectively. 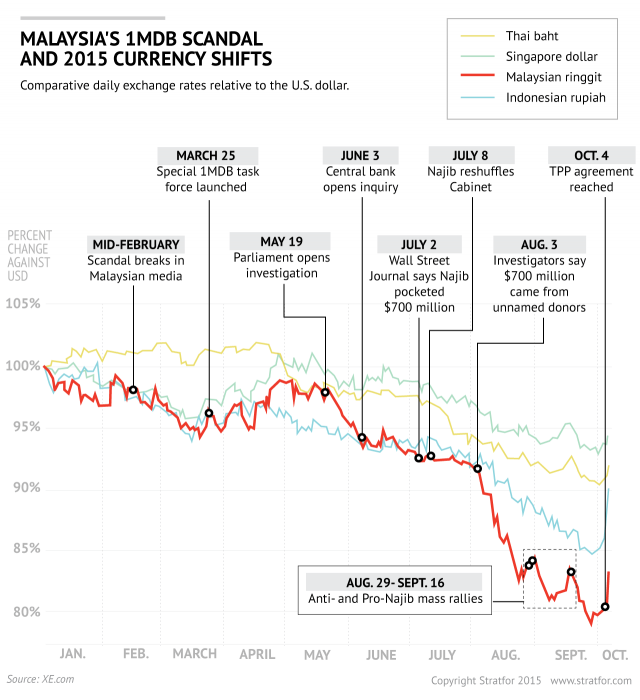 However, given how the scandal has since led to tensions within the ruling UMNO party, brewing political risks may derail this upward momentum in the currency, according to analysts from the National Australia Bank (NAB). “Political risk has increased with growing tensions seen in the ruling party (and could) potentially impact market confidence in the government’s stability,” analysts Christy Tan and Julian Wee wrote in a note released Thursday, referring to the latest twists and turns in Malaysian politics including ex-leader Mahathir Mohamad quitting the ruling party for the second time. “The twin threats going forward are additional revelations from external investigations into 1MDB, and the risk of Mahathir starting a new political party that shears off a sizable portion of UMNO and puts the viability of the government under threat,” NAB analysts added. To be sure, there are other analysts who are more sanguine. Apart from politics, the ringgit could also be * by movements in global oil prices. NAB reckons the recent bounceback in the price of crude oil may soon be losing momentum, which would yet again dim the fortunes of the oil exporter. NAB analysts also think that the central bank will be “more circumspect about intervening to support the ringgit” given how Bank Negara’s foreign exchange reserves have fallen 27 per cent to US$87.7 billion as of Feb 2016. Meanwhile, investors will also be keeping an eye on the replacement for central bank Governor Zeti Akhtar Aziz, whose term ends next month. Thus far, Prime Minister Najib has given no indication who will succeed the veteran central bank governor. “The Wall Street Journal reported over the weekend that the Prime Minister is set to announce that his choice for the new central bank governor will be Irwan Serigar Abdullah, the top bureaucrat at the Finance Ministry and advisor to 1MDB. The WSJ also reported that this choice was in opposition to outgoing governor Zeti Akhtar Aziz,” NAB’s report said. The nomination of a new central bank governor from outside the central bank might trigger more concerns about future monetary policy direction and the central bank’s independence, analysts noted. Given the raft of domestic risks, analysts that Channel NewsAsia spoke to largely expect the ringgit to weaken against the Singapore dollar moving forward. Expectations for the Monetary Authority of Singapore (MAS) to keep monetary policy steady at its policy review in April will also keep the Sing dollar fairly steady, according to ANZ’s FX strategist Irene Cheung. “We are looking at no change given how previous appreciation policies have been modest. February’s downgrade in inflation forecast is also nothing expected hence our base scenario is for MAS to not do anything,” said Ms Cheung, who expects the Sing dollar to fetch 3.02 ringgit by the end of 2016. Investigations ordered by Malaysia’s leader into graft allegations at a state-development fund have been undermined by political pressure and a lack of transparency, according to documents and interviews with people involved. Evidence possibly central to the probes was placed off limits or ignored, The Wall Street Journal found. Potentially crucial clues weren’t scrutinized. And at least one key figure, Malaysian Prime Minister Najib Razak himself, wasn’t interviewed by investigators. The promise of a thorough and transparent accounting of what happened at the fund, 1Malaysia Development Bhd., or 1MDB, has helped Najib fend off domestic criticism. Now, though, with six foreign countries investigating allegations of corruption at 1MDB, pressure is rising at home for greater transparency. Najib in March 2015 pledged an independent probe into 1MDB, which he founded to spur economic development. He ordered the auditor general, an investigative agency whose findings are typically public, to compile a report on the fund’s activities. And he ordered the contents to be reviewed and debated by the Public Accounts Committee, a parliamentary body. But the auditor general’s report into 1MDB, completed in March, was classified under Malaysia’s Officials Secrets Act, shielding it from public view. The committee, however, made no mention of the $7 billion estimate when it published its report on 1MDB in April and said only that an unspecified amount of money was unaccounted for. “The issues are of such public importance that there cannot be any excuse for making the auditor general’s report an official secret,” said Razaleigh Hamzah, a senior politician with the United Malays National Organization, Najib’s ruling party. Hasan Arifin, a ruling-party politician who heads the committee, didn’t call Najib to testify even though Najib was chairman of 1MDB’s board of advisers and also is Malaysia’s finance minister, giving him ultimate oversight over the fund. Other participants in the inquiry repeatedly asked him to seek Najib’s testimony, said Pua and two current and former ruling-party politicians on the committee. KUALA LUMPUR: Bank Negara Malaysia governor Datuk Muhammad Ibrahim said the fine paid by 1Malaysia Development Bhd (1MDB) for non-compliance marks the end of the central bank's investigation. "There are other laws administered by other authorities and we will continue to give our cooperation on this matter,"he said at a media briefing on the sidelines of the 20th Banking Summit today. On Wednesday, 1MDB announced its full payment of a fine following a letter of administrative compound to the fund for non-compliance with certain directions of BNM. On whether Bank Negara is working with Singapore's Monetary Authority of Singapore, Muhammad responded "we have done our investigations". MAS withdrew the licence of Swiss merchant bank BSI Bank following investigations on its links with 1MDB. Asked to comment on the ongoing BSI Bank investigation, Muhammad said regulatory authorities will make the investigation based on the rules and regulations based on the jurisdiction. "As far as we are concerned, there are other laws administered by other authorities." Meanwhile AmBank Group chairman Tan Sri Azman Hashim described the RM53.7 millon fine by BNM as an expensive lesson and the financial institution is working hard to ensure `it does not happen again'. The penalty which was imposed in November last year was due to a breach of regulations under Section 234 of the Financial Services Act 2013 and Sect 245 of the Islamic Financial Services Act 2013 by AmBank (M) Bhd and AmBank Islamic Bhd. Azman, who is also chairman of the Financial Services Professional Board (FSPB), said compliance in the current environment is a difficult issue as even global banks with the best systems in place have also been fined millions due to non-compliance. On the impact of the woes of troubled 1MDB to the banking system, he said regulations are getting tougher and money launderers are also getting smarter. The human factor cannot be overlooked too, he said, pointing to his 12,000 staff strength. "It is a costly thing but we need to upgrade and train our staff to be knowledgeable." Following the penalty, the sixth largest lender agreed to a four-year programme of work towards achieving market best practices and announced it would set aside an average of RM25 million annually for four years for investment in systems, infrastructure and training. (Bloomberg) -- When Malaysia's largest sovereign wealth fund asked bankers to pitch for work arranging a US$750 million bond sale in December, one big name was conspicuous by its absence: Goldman Sachs. Khazanah Nasional Bhd omitted the Wall Street firm from the list of banks invited to bid on that and other bond transactions in the past three years, according to a person familiar with the matter. During that time, Goldman slid down the Malaysian deal league tables, cold-shouldered by potential clients concerned about negative publicity from its dealings with 1Malaysia Development Bank Bhd (1MDB), another government entity. Chief executive officer Lloyd Blankfein guided Goldman deeper into emerging markets over the past decade, arguing that their rising influence in the global economy justified the higher risks involved. Malaysia, where Goldman Sachs collected eye-popping fees from 1MDB about three years ago, has come to symbolize the potential outsize rewards of developing economies - but also the perils. Fallout from working with 1MDB, the embattled investment fund at the center of investigations from the US to Singapore, has led to a wider collapse in Goldman's once-thriving business in Malaysia, which it said a few years ago offered "very positive" prospects. Work advising Malaysian clients on mergers and acquisitions, share offerings and bond issues has all but evaporated over the past few years, according to data compiled by Bloomberg, and several senior bankers involved in Malaysian deal-making have left since 2013. "I'm not sure how long it'll take for Goldman to recover from this," said Ang Ser Keng, a senior lecturer in finance at the Singapore Management University. "They will definitely hurt from this," Ang said, referring to Goldman Sachs's association with 1MDB. The bank's fall from grace in Malaysia stands in stark contrast with its prosperous run under Tim Leissner, the former star Goldman banker who drew many Malaysian clients to the firm and helped oversee three bond offerings for 1MDB in 2012 and 2013. Those deals proved the turning point for the bank's fortunes. Soon after, Goldman got unwanted publicity over the above-average fees and commissions it earned on the bond sales. More recently, 1MDB has found itself at the centre of a complex scandal over its ballooning debts and financial ties with Malaysian Prime Minister Najib Razak. Mr Leissner left Goldman in February and now lives in Los Angeles with his wife, the former US model and fashion designer Kimora Lee Simmons. He has been subpoenaed by the US Department of Justice in connection with its investigation into the Malaysian fund, according to people familiar with the matter. US prosecutors are examining an alleged transfer of hundreds of thousands of dollars from a former 1MDB employee to a start-up company which Leissner was backing, according to other people briefed on the matter. The deepening global fallout of the 1MDB scandal was underscored on Tuesday, when Singapore took the rare step of ordering Swiss private bank BSI SA to shut its unit in the city- state because of its ties with the Malaysian fund. Mr Leissner hasn't been accused of wrongdoing. Malaysia's premier and 1MDB have consistently denied any wrongdoing. Goldman is working with an outside law firm to conduct an internal examination and is reviewing its own role in helping 1MDB raise capital, according to people with knowledge of the matter. There is no indication that the firm engaged in any wrongdoing, the people said. Goldman expressed confidence in its Malaysian business. "Malaysian deal activity has been generally quiet but our dialogue with clients is positive and we are seeing a growing pipeline of transactions," said Hong Kong-based spokesman Edward Naylor. An official from Khazanah declined to comment. Last year, Goldman didn't arrange a single share sale in Malaysia. In mergers advisory involving companies from the country, it ranked 18th, behind global rivals such as HSBC Holdings, JPMorgan Chase & Co and UBS Group, Bloomberg-compiled data show. In 2012, the last full year before reports emerged about its commissions from the 1MDB bond sales, Goldman was second in advising on M&A, trailing only local lender Malayan Banking Bhd. Goldman led the league tables for arranging dollar bond sales by Malaysian companies from 2011 to 2013, bolstered by the 1MDB debt offerings. The firm hasn't worked on any such offerings since then, the data show. The lowly ranking in Malaysia is also a contrast to Goldman's wider investment banking success in the Asia-Pacific region, where it typically is among the top arrangers of initial public offerings and advisers on corporate mergers. At the same time, Malaysia's investment-banking fees have dwindled since 2012 as deal-making slowed. In 2009, Mr Leissner was quoted as saying that the outlook for Malaysia's capital markets and asset management industry is "very positive." Goldman looked forward "to playing a larger role in their development," Mr Leissner said in a press release issued by the Malaysian Securities Commission when it approved the bank's application to set up fund management and corporate finance advisory operations in the country. Goldman played multiple roles during its business relationship with 1MDB. In 2012, it advised the firm on its US$2.8 billion acquisition of power assets from Ananda Krishnan, Malaysia's second-richest man with interests in telecommunications, media, energy and real estate. The following year, the bank helped 1MDB purchase the Jimah power plant in Selangor, Malaysia, a deal that was completed in 2014. In 2012 and 2013, Goldman handled three 1MDB bond sales totaling US$6.5 billion that yielded fees, commissions and expenses of US$593 million, or about 9 per cent of the money raised, well above the industry norm. The bond deals involved the bank putting its own capital at risk. Those transactions also coincided with the end of Goldman's bull run in Malaysia. Yusof Annuar Yaacob, the deal- maker who ran its investment banking business there from Kuala Lumpur for three years, joined Deutsche Bank in early 2014. Roger Ng, another Goldman Sachs banker focused on Malaysia, also left that year. Singapore-based Udhay Furtado now oversees those operations. Though Goldman Sachs remains a dominant force in deal-making across the Asia-Pacific region, like other banks it has suffered from the wider downturn in business in Southeast Asia in recent years. Last year, it reduced the size of its investment-banking team in Singapore by about 30 per cent. Standard Chartered, Malaysia's CIMB Group and Nomura Holdings have also cut staff in the region. So far this year, Goldman ranks third for mergers and acquisitions in Malaysia, according to data compiled by Bloomberg. The US bank is advising two foreign companies - Skyscanner Ltd in the UK and Garena Interactive Holdings Ltd in Singapore - in which Khazanah bought minority stakes. Goldman was last invited to bid on a Khazanah bond issue in 2012, though that mandate eventually went to CIMB, Deutsche Bank and JPMorgan. For the December pitch for which Goldman wasn't invited, the bidders included Barclays Bank, UBS, Morgan Stanley, Deutsche Bank and CIMB. Standard Chartered, CIMB and DBS Group won the mandate. The funds were used to refinance other bonds that came due in March. (Bloomberg) -- The ringgit led declines in Asia and Malaysian stocks fell as state-investment company 1Malaysia Development Bhd came back to haunt the currency just as a pickup in oil was stoking a recovery. A week after Prime Minister Najib Razak, who chairs the company's advisory board, was cleared in a probe over any wrong doing related to a political donation, the Singapore authorities said on Monday (Feb 1) they had seized many bank accounts related to possible money laundering associated with the firm, which was in the limelight last year due to concern about its rising debt. This followed an announcement days ago by Swiss Attorney-General that it's pursuing an investigation into alleged diversion of funds from 1MDB. The ringgit weakened 0.7 per cent to 4.1845 per US dollar as of 9.56am in Kuala Lumpur, after last week posting its biggest rally since October as the outlook for the oil-exporting nation's finances improved amid a recovery in Brent crude. Oil fell for a second day on Tuesday as Malaysian markets reopened after a holiday on Monday. The ringgit also weakened to 2.9393 to the Singapore dollar as of 10.41am, 0.7 per cent lower than its close on Monday. "It appears that the dust is being kicked up on 1MDB all over again," said Mr Vishnu Varathan, a Singapore-based economist at Mizuho Bank Ltd. "Downside pressures for the ringgit could re-emerge." The ringgit climbed 3.3 per cent in January, more than any other in emerging markets, on speculation 2015's 19 per cent decline was overdone. Malaysia's benchmark stock index fell 0.5 per cent after climbing 2.6 per cent in the five days through Jan 29. Government bonds due in 2020 rose, with the yield falling two basis points to 3.36 per cent, Bursa Malaysia prices show. 1MDB has been the subject of overlapping investigations at home plus Switzerland and Hong Kong amid allegations of financial irregularities. Singapore has seized "a large number" of bank accounts in connection with possible money laundering, the Monetary Authority of Singapore and Commercial Affairs Department said in a joint e-mailed statement on Monday in response to queries on the company. A statement from Swiss prosecutors last week said they are seeking legal assistance from Malaysia after a probe they conducted into 1MDB revealed "serious indications" that about US$4 billion (S$5.69 billion) may have been misappropriated. Datuk Seri Najib is "not one of the public officials under accusation" in that investigation, Mr Andre Marty, a spokesman for the Swiss Attorney-General's office, said on Monday in a statement. ‘Bumpy ride’ ahead for Asian markets? Knowing these 6 things could save you a lot of pain! SINGAPORE (May 27): A Fed interest rate hike looms like a guillotine over the Asian markets. There is “no doubt in our minds” that the US Federal Reserve “will be raising rates in June or July — and at least twice more this year,” says Manu Bhaskaran, a partner and head of economic research at economics consultancy Centennial Group Inc, in this week’s edition of The Edge Singapore. What do we really need to know about how the Fed rates affect investors in Asia? A Fed rate hike means that the US economy, still the single largest market in the world for Asian exports, is recovering nicely. The US recovery will eventually translate into a more convincing recovery in Asian exports, but it will take time. The equity markets have been subject to a lot of stress since August last year when fears over the Chinese renminbi drove asset prices down. But what this means is a lot of bad news is already priced in, so the chances of a further steep fall are less. Even as the US raises rates, the European Central Bank and the Bank of Japan are likely to expand their quantitative easing programmes. Chinese policy is also likely to lean towards an easier stance. While unlikely to be as impactful in Asia as the US policy, these should provide some support – and offer some hope to investors. With Japanese authorities likely to eventually depress the yen in the coming months, and fears over the troubled Chinese economy keeping the yuan weak, a perfect storm is brewing for Asian currency depreciation. Where the property market is already weakening as a result of excess supply and declining confidence, we could see steeper falls. Mortgage rates are bound to rise further at a time when rising supply is already hurting, so the prospects are poor for real estate. The search for yield is no longer so keen that investors are prepared to overlook weaknesses in emerging markets. Markets could react disproportionately in the event of unexpected downside risks, such as a political surprise. In other words, get ready for a bumpy ride! KUALA LUMPUR: Bursa Malaysia is expected to trend higher next week prompted by the ringgit's strength and upswing in global crude oil prices, an economist said. Affin Hwang Investment Bank Vice-President and Retail Research Head Datuk Dr Nazri Khan Adam Khan said the local stock market received a boost in the recent week after Brent crude exceeded US$50 (RM203.14) per barrel for the first time this year and the momentum was expected to continue next week. He said the improvement also helped the ringgit recover lost ground to RM4.07per US dollar from as low as RM4.13 on Tuesday. Nazri Khan said other developments that influenced the local stock market was the impending outcome from the seven major advanced economies (G7) meeting in Japan. "There is expectation that the meeting will come out with a stimulus to support global economy," he told Bernama. For the week just-ended, the benchmark FTSE Bursa Malaysia KLCI (FBM KLCI) gained 8.4 points to 1,637.19, spurred by the appreciating ringgit and recovering oil prices. On a week-to-week basis, the FBM Emas Index added 38.08 points to 11,447.8, the FBMT100 Index rose 42.32 points to 11,141.71 and the FBM Emas Syariah Index was 30.35 points higher at 11,960.37. On a sectorial basis, the Finance Index edged up 2.2 points to 14,250.52, the Plantation Index improved 29.91 points to 7,492.56 and the Industrial Index perked 42.91 points to 3,111.28. Weekly turnover increased to 8.51 billion units, valued at RM8.39 billion, from the previous week's 8.41 billion units valued at RM8.85 billion. Main market volume rose to 5.61 billion units, valued at RM7.89 billion, versus 5.34 billion units, valued at RM8.23 billion, recorded last week. Warrant turnover improved to 654.72 million units, worth, RM107.95 million against 628.75 million units, valued at RM94.24 million, reported previously. Can Azman pull it off? How do we get out of the debt trap? KWAP’s Wan Kamaruzaman, who handles more than RM100bil in funds and a seasoned fund manager, gives his frank views on the market, the US interest rates and sectors that are oversold. IN an unprecedented style, the markets around the world have been topsy turvy since the beginning of the year as investors adjust their portfolios to cater for a season of weak corporate earnings. There was a respite in the months of March and April, but come May the bullish sentiments are jaded. Retirement Fund Inc (KWAP) chief executive officer Datuk Wan Kamaruzaman Wan Ahmad reckons that the sentiments enveloping the market is justified given the weak earnings. “The growth in the equity market needs to be supported by corporate earnings and at the moment corporate earnings are still rather weak under this slow economic growth environment,” Wan Kamaruzaman tells StarBizWeek. KWAP manages close to RM110bil in funds as at Dec 31, 2015. Of the funds, about 60% goes to fixed income instruments, while 30% is allocated to domestic equities and 6% for international equities. He reckons that it is unlikely for the market to experience an imminent sharp decline due to continuous support by local institutional funds. “With domestic support from institutional funds, we think that should there be a plunge in the market, it would be marginal. “The equity market at the moment is very choppy but at the same time I feel pretty strongly that it should be earnings driven,” he says. KWAP’s in-house research suggests that the FBM KLCI could trade at the 1,770-level in the long term. However, Wan Kamaruzaman says that at present levels, corporate earnings are not enough to drive the market to that level. He nonetheless sees value in certain sectors such as banking that has been battered down recently. “With lesser non-performing loans (NPLs) and cost controls, I think the banking industry can do well. “Some banking stocks are even below net assets and even if loan growth is slowing down to about 7%, the reality is that it is still a decent growth. With operational costs and interest costs under control, net interest margins could improve further. So I quite like the banking sector,” he says. 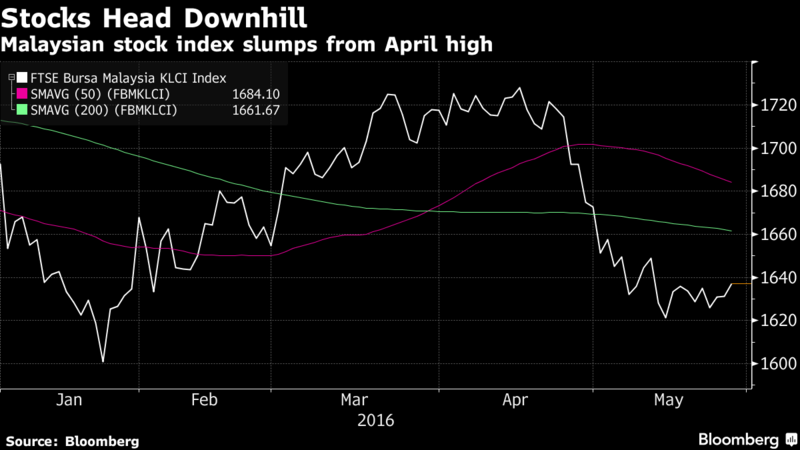 The short rebound in March and April is now over in the emerging markets. Within a one-month period, the FBM KLCI saw its gains for the year wiped out after falling by 5%, taking the index negative year-to-date. But the FBM KLCI is not alone. Emerging markets around the world are also in a bearish mood as indicated by the MSCI’s emerging market share index falling almost 3% last week. One of the reasons is the strong possibility of interest rate hikes by the US Federal Reserve that is now back on the table. While some say further interest rate hikes by the Fed would not be good for Malaysia and the region, Wan Kamaruzaman begs to differ. He says the underlying issues of the recent sell-off in the emerging markets are concerns over slowing growth and rising debt. “I think we have to address the concerns on the local economic growth through policies. “The global economies are challenging and the domestic numbers such as consumer spending and confidence as well as unemployment rate are not looking as robust as it was previously. For instance, Wan Kamaruzaman suggests that Malaysia has leeway to cut interest rates in order to support economic growth. The gross domestic product (GDP) growth for Malaysia has weakened for four quarters in a row and growth for this year is expected to be between 4% and 4.5%, which is on the downtrend. The country’s GDP grew at 5% last year. With the economy expected to grow at a slower pace this year, the big question mark is how will the local companies grow their earnings? “We have a lot of room to cut rates. Just look at where Thailand is. Also other countries have much lower interest rate policies compared to Malaysia,” he says. Thailand’s benchmark interest rate is at 1.5%, while Japan and European countries have adopted a negative interest rate regime. He reckons that with even if there were two rate hikes by the Fed this year, the fear of outflow is not strong because the yields offered by Malaysian government securities (MGS) is attractive. “The differential in the spread between ringgit bond yields and US treasuries is still quite compelling at about 2.5%. Even if the US should increase its interest rate an additional 50 basis points, Malaysian papers are still attractive,” he says. He adds that MGS would continue to attract investors especially with the current low interest rate environment around the world as well as negative interest rates in some developed economies. “The thing is that you have to base investment decisions on the fundamentals of your countries... it is not about what the US is doing. We need to focus on what we need to do for the country,” Wan Kamaruzaman says. He adds that the local market is also dictated by fund flows rather than fundamentals. According to MIDF Research’s recent report, foreign investors have sold Malaysian equities for two consecutive weeks since May 13 amounting to RM2.16bil of net outflow. The local institutions have also been busy picking up the slack, mopping up about RM1.2bil equities. Wan Kamaruzaman says the recent appointment of the Bank Negara governor has been viewed positively by the market, but he points out that there are more issues that need to be addressed. “As long as the right decisions are made, the funds will stay,” he says. For example the appointment of governor, who Wan Kamaruzaman feels is familiar with the market and business. KWAP mainly invests in bonds and equities. What do you think of the current market conditions for these two asset classes? There are two separate things when it comes to bond and equities. The equity market at the moment is a very choppy market but at the same time I feel strongly that it should be driven by corporate earnings. Ultimately, productivity and corporate earnings must support the equity market. As for the debt market, it remains stable. There are some of the sectors that still look decent, they are not experiencing strong growth but obviously decent enough to warrant long-term investors like us to continue to invest, because of the dividend and potential capital gains. What are the sectors that you are most bullish on? Sectors like banking obviously, I’m a proponent of banking stocks. Banking counters have been battered. Of which some of the stocks are even below net assets. Even if loan growth is slowing down to about 7% but the reality is that it is still decent. Other than banking, it would be the construction sector on the back of vast construction projects in the country. Companies like IJM is a combination of construction and property development. What do you like about the Malaysian bond market? I think the new norm of low interest rates and negative interest rates would see Malaysian government securities (MGS) continue to attract investors into this space. Under the global low interest rate environment, I think the bond market is in no danger in terms of correction because of the attractive yields it offers.What is more likely is a cut in OPR (overnight policy rate) rate or SRR (statutory reserve requirement). And for those reasons, bond market would continue to experience a rally, which is positive for bond holders. There is a view that despite the recent decline in the FBM KLCI, the market is expensive in terms of valuation. What do you think about this view? Of course in terms of valuations we have come down because we have two years of negative performance since 2014. That year we dropped by about 5.6% and last year it fell by 3.9%. But if based on trends, there has never in the history of FBM KLCI been three years of negative performance. But that doesn’t mean it is not going to happen. Because the problem is that the fall has not been very significant. It was a single-digit correction, not like other countries that fell by double digits. But for now, the stock market would need support from corporate earnings which are weak at the moment. It is not an easy market. Even our domestic economic numbers are not looking robust as before. For example, consumer confidence and expenditure are softening and unemployment has gone up. So, this is a trial time for those in the equity space... for that reason I would not be surprised if the equity market should have another negative year, but it won’t be a dip. There is enough support by institutional funds, for example from EPF and even from KWAP. It does not include the unit trust, insurance companies, other pension funds like LTAT and Socso. With all these funds continue to grow, obviously there are more support for the domestic market especially now that we can’t invest abroad. So our focus now is on the domestic market. Even our external managers are very long in cash, so everytime there is a dip in the market it would be an opportunity for them to use their cash. In the current market, what is your strategy for identifying investment opportunities? We are trying to dig deeper into our research capability, for us it’s about understanding the company that we are going to invest in. We are scaling up our research capability for stock picking especially in the small and medium market capitalisation stocks. We have been involved in the small-cap space over the last three years, and the performance has been better than the big-cap stocks. Our criterion for small-cap stocks is below RM2bil market capitlisation. We have our own stock universe that have to meet six out of 10 financial criteria, which we can’t share, but dividend is not part of it. This is because small cap companies are in the growth stage and obviously dividend is not the criterion. Two interest rate hikes in US? Do you expect the US Federal Reserve to increase interest rate later this year? The Fed has been trying to reduce excessive volatility by providing forward guidance and right now the forward guidance is that there could be a possible June interest rate hike, because their economic numbers are quite good. Although it is not strong but it is very consistent and summer months are coming, where economic activities tend to pick up. During the winter months, which are in the first quarter of the year, usually slower numbers, but it will pick up in summer months. I’m looking at two interest rate hikes for the year by the Fed. Do you think the market can take two interest rate hikes by the Fed, especially with central banks across the world cutting interest rates? The theme is divergence. It is a divergence in the US with some other developed market. This is because the US economy is doing far better than that in Europe and Japan. The US economy is growing over 2%, which is decent for that size of economy. Whereas in Europe about more than 1%. But as a continent, economic growth in Europe is actually quite well and they even in surpluses. The US economy is doing better than what most people think, because its economy has made some adjustment to the changes in technology. In my opinion, the US market has made the adjustment by adapting to technology that has caused creative disruption.For that reason, a lot of economies are still adjusting to that tech-edge era, whereas the US has gone over that. For that reason, the US is doing well. That is why you can see unemployment in the US has already below 5% and the only problem is to achieve full time employment. But that is because nowadays people prefer to work on their own free time and free will. Meanwhile, in some countries in EU the unemployment number is still in the quite high. In Japan, after two decades of low growth they are now even going to negative interest rate and still not working. So what do you think about the negative interest rate regime adopted by some developed economies? One reason why the negative interest rate strategy is not faring well is that even if you cut interest rate, the long-term rate doesn’t go down much, it would only go down marginally. So the the effect is not that great. When you look from the angle of cutting interest rate to promote more corporate borrowings, under this kind of gloomy economic scenario, who wants to borrow. So even if there is a negative interest rate, it is not working because you want to encourage people to borrow when there is not reasons to borrow money. We feel that negative interest rate is more of trying to create competitive devaluation in currency. It is method use to weaken one currency to become more competitive. The market would probably think that is your last move because after that you can’t go any lower than negative. And that is why the currency market reacts differently. How would the interest rate hike in the US impact Malaysia? First thing is that the expectation is a modest interest rate increase from a very low base. So there is nothing wrong for the Fed adjusting interest rate to maybe half a percentage this year, making it just about 1% by end of this year. So at 1%, the interest differential is still very positive for a country like Malaysia. But would that cause the ringgit to go under pressure again? As long as interest differential is still in favor for investors to hold ringgit. Malaysia OPR is 3.5%, if the US interest rate goes up to 1% the interest differential is still at 2.5%, which would still favor the ringgit. So i think it is still a decent interest rate differential for investors to hold the ringgit instead of US dollar. But the thing is that you have to base on the fundamentals of your countries, it is not about what the US doing. We need to focus what we need to do for your country. Our GDP growth has gone down for several quarters and the overall growth for this year is expected between 4%-4.5%, which is softer than last year. We could address the concerns with adjusting policies. Malaysia have a room to cut interest rate, because look at where Thailand is, and the some countries that have much lower interest rate policy compared to Malaysia. Where do you think the local market is heading until end of the year? I think the market will hold steady. Our in house research’s outlook for FBM KLCI is about 1,770 level. But that level must be supported by corporate earning, which is not there at this point. But you never know. For example the banking sector, with lesser non-performing loan (NPL) and cost controls, I think the banking industry can do well. Compared to the other market around the region, how stable is Malaysia compared to the other emerging economies around the region? Actually Malaysia is very stable. It is obvious based on banking institutions and their exposure to regional market. CIMB Group for instance their main problem is in Thailand and Indonesia operations, but not in Malaysia. This goes to Maybank as well. Edge Weekly reported in its latest May 30 - June 5 issue that while banks had generally delivered a relatively good set of results, the 544 non-bank companies that had announced their results saw their net profit dropped 4.3% from a year earlier. "The sectors that dragged down corporate earnings were consumer discretionary, utilities, property and oil and gas services. As a result, analysts are likely to revise downwards their earnings estimates," Edge Weekly reported. Edge Weekly quoted Etiqa Insurance & Takaful research head Chris Eng as saying stockbroking firms might cut their KLCI year-end targets following poor 1Q earnings. Yesterday (May 27), the KLCI rose 6.1 points to close at 1,637.19. On April 25 this year, the KLCI ended at 1,714.51. At current levels, the KLCI, which had declined 3.27% so this this year, was traded at a price-earnings ratio of 18.15 times, according to Bloomberg data. Japan's Nikkei 225 was traded at 20.07 times while Hong Kong's Hang Seng was transacted at 10.29 times. airlines have already been priced in," he said. FBM KLCI closed @ 1,637.19 (+6.1, +0.37%) on 27 May 2016. PETALING JAYA: The estimated net amount offloaded by foreign investors edged down to RM709 million last week from RM1.15 billion the prior week, according to MIDF Research. Its research head Zulkifli Hamzah, in his weekly fund flow report yesterday said foreigners were net sellers on all days but one last week. As of Friday, he said, foreign investors had been selling in 21 out of 23 straight days. “We note that prior week’s selling momentum was carried forward into last week. The market started the week with softer foreign selling at RM89.3 million,” he said. However, the momentum picked up on Tuesday with an attrition of RM318.5 million. It was the second highest year-to-date daily attrition. Selling pressure subsided slightly to RM238.9 million on Wednesday, with the pace slowing down further to RM102.8 million on the following day. Foreigners finally reversed the selling trend, which had lasted for 10 straight trading days, on Friday with net buying of RM40.1 million. According to Zulkifli, last week’s foreign withdrawal further reduced the cumulative net foreign inflow into the local stock market this year, to an estimated RM2.48 billion, down from RM3.19 billion in the week before. Although the cumulative net foreign inflow declined for the fifth week, Zulkifli said, the amount is still modest relative to the RM19.5 billion and RM6.9 billion net outflows in 2015 and 2014 respectively. Daily total foreign trade was weak on Monday at RM580 million, and consistently stayed below RM1 billion in the following three days. However, Zulkifli said, trading spirit picked up on Friday to RM1.29 billion, the third highest daily trading volume in May. Local institutions continued to support the market, mopping up RM679 million last week. The participation rate, however, declined for the second week to RM1.82 billion, the smallest amount since February this year. Retail buyers turned net buyers last week by loading up RM30.4 million. Their participation rate edged up marginally to RM607 million. PETALING JAYA: Oil and gas (O&G) players say they have more or less made the required impairments that have come about due to weak crude oil prices. However, large impairments seem to have come from the big boys of the O&G industry, while not many of the smaller players have set aside provisions for their assets. Heading the list of impairments is SapuraKencana Petroleum Bhd that has booked in impairments of RM1.7bil in its last two quarters. The others that have bitten the bullet are Malaysian Bulk Carriers Bhd that has an impairment of RM900mil, followed by service providers Icon Offshore Bhd and UMW Oil & Gas Corp Bhd (UMW O&G) that have provided for RM377mil and RM347.7mil. Icon provided for the impairment very early last year when oil prices had started to fall, while UMW O&G set aside the amount over the last one year. Whether more impairment has to be set aside will depend on crude oil, which last traded at US$49.45 per barrel. Some say it is still too early to assess whether future impairments would be needed. Offshore support vessel (OSV) provider Alam Maritim Resources Bhd, for instance, last made some RM29mil in provisions in the quarter ended Dec 31, 2015 to cover for potential losses linked to its vessels and receivables. “In the most recent quarter, the first quarter ended March 31, we made no provisions but think it is still too early to anticipate if there are any more to come... no utilisation of vessels means an impairment has to be made,” managing director and chief executive officer Azmi Ahmad told StarBiz. Notably, just half of the total amount of Alam Maritim’s vessels were chartered during the first quarter of this year. This is a far cry from the 82% utilisation rate when oil prices were at their peak. For another of Alam Maritim’s peers, UMW O&G, only two units (Naga 7 & out of its eight rigs were deployed in the first quarter of 2016. Naga 4 was warm-stacked in the first quarter of this year with zero utilisation as clients deferred their drilling programmes, according to a note by UOB KayHian. UMW O&G president Rohaizad Darus, who recently announced job cuts at the company, said the firm’s impairments stood at RM347.7mil for the whole of last year and that it would relook the situation if oil prices perform worse than last year. “We would re-evaluate only if the situation and outlook are worse than in 2015,” he said when asked if there would be further provisions this year. He also said the impairments could be reversed should the industry recover and there were more contracts. A Kenanga Investment Bank O&G analyst said he believed O&G companies’ provisions will “moderate” this year from the last. “Unless the oil price goes back to US$30, we don’t think there will be any spike in provisions made this year,” he said, adding that Kenanga’s oil price target is US$47 by year-end. An AmInvestment Bank analyst, meanwhile, concurred, saying that the worst was likely over. Crude oil has climbed over 37% from US$36 last December on news of disruption of the global supply and the general view is that it should hover around the US$50 level for the rest of the year before tapering off next year. A combination of idle oil rigs and weak charter rates has cut into the profits of O&G services companies such as Alam Maritim and UMW O&G. Generally, weak oil prices have made it unattractive for companies to hire vessels for upstream exploration and production activities. KUALA LUMPUR: Bursa Malaysia is expected to continue its upward momentum next week on a healthy outlook for the domestic economy and a recovery in oil prices, an economist said. Affin Hwang Investment Bank Vice-President and Retail Research Head Datuk Dr Nazri Khan Adam Khan said Malaysia's recent positive manufacturing purchasing managers index (PMI) should provide confidence among investors. "Malaysia's April broad money (M3), which expanded 1.5%, which proved that our economy is on a healthy track, should also provide a clearer direction to investors in the coming weeks," he told Bernama. On foreign markets, he said the European Central Bank's decision to maintain its interest rate level should provide support to the local benchmark index. "The US Federal Reserve is also expected to put the interest rate hike plan on hold, awaiting the outcome of the British referendum," he added. Moving forward, he said investors may focus on consumer-related stocks, on expectations that the public would begin to stock up ahead of the Hari Raya holidays. Nazri foresees the FBM KLCI resistance level at 1,650 followed by 1,680, with the support level at 1,620 followed by 1,600 points. For the week just ended, the benchmark FTSE Bursa Malaysia KLCI (FBM KLCI) eased 0.73 point to 1,636.46, dampened by renewed concerns over a possible US interest rate hike and mixed economic data from China. On a week-to-week basis, the FBM Emas Index added 13.71 points to 11,461.51, the FBMT100 Index rose 12.33 points to 11,154.04 and the FBM Emas Syariah Index was 22.93 points higher at 11,983.30. On a sectorial basis, the Finance Index edged up 26.76 points to 14,277.28, the Plantation Index slipped 11.98 points to 7,480.58 and the Industrial Index fell 28.02 points to 3,083.26. Weekly turnover decreased to 7.19 billion units valued at RM13.13 billion, from the previous week's 8.51 billion units worth RM8.39 billion. Main market volume rose to 5.67 billion units valued at RM12.80 billion, versus 5.61 billion units worth RM7.89 billion recorded last week. Warrant turnover improved to 736.10 million units worth RM110.40 million, against 654.72 million units valued at RM107.95 million previously. PETALING JAYA: The net amount offloaded by foreign investors surged to RM1.2 billion last week from RM709 million in the prior week, marking the highest weekly sell-off since October 2015. MIDF Research said this is estimated based on transactions in the open market, which excluded off market deals. "Foreign selling on Bursa continued for the sixth consecutive week, the longest selling streak since last September," it said in its fund flow report yesterday. Foreigners were net sellers every day last week. As of Friday, foreign investors had been selling in 26 out of 28, straight days. "We note that prior Friday's foreign buying appeared to be transient. The momentum halted on Monday with attrition of RM177.4 million. The selling pressure peaked on Tuesday when foreigners dumped RM597 million. It was the second highest daily selling since August 2013, after the RM657.6 million attrition three weeks ago. Selling pressure later on subsided to RM189.5 million on Wednesday, with the pace slowing down further to RM128.1 million on the following day. Foreigners ended the week with a selling of RM104 million on Friday." MIDF said last week's foreign withdrawal further reduced the cumulative net foreign inflow thus far this year into share listed on Bursa to an estimated RM1.28 billion, down from prior week RM2.48 billion. The figure has been on a declining trend for the sixth week. Foreigners offloaded RM19.5 billion and RM6.9 billion in 2015 and 2014 respectively. Foreign participation rate surged high to RM2.59 billion last week. The increase was mostly driven by the staggering RM9.04 billion daily trading on Tuesday (May 31). It was a common trading pattern historically due to the implementation of MSCI new weighting the day after. Apart from this, trading was also active on Wednesday and Thursday, standing at RM1.05 million and RM1.07 million respectively. Local institution continued to support the market, mopping up a staggering RM1.2 billion. This was its highest weekly buying since Aug 28, 2015. Meanwhile, its participation rate increased by RM381.9 million from prior week to RM2.2 billion. KUALA LUMPUR (June : The FBM KLCI is expected to extend its momentum today and stay above the 1,650 point level, in line with the overnight gains at most global markets. Stocks gained broadly on Tuesday, helped by buoyant oil prices, a day after Federal Reserve Chair Janet Yellen pushed back expectations for an interest rate increase without raising concerns over the strength of the world's largest economy, according to Reuters. Crude oil futures traded above the psychologically important $50 mark, touching a 2016 high, supported by a weaker U.S. dollar, which wallowed near a four-week low, it said. Areca Capital Sdn Bhd chief executive officer Danny Wong Teck Meng yesterday said that the FBM KLCI is gaining momentum, further strengthened by the slight recovery of crude oil prices. "Oil price has also supported a rebound in ringgit, which would attract foreign funds. “We do not draw a supporting or resistance level, but from how it (KLCI) has been performing lately, we prefer not to rule out the possibility that it will break 1,700 points," he added. But Malaysia’s large pool of state institutional funds likely to help limit any sharp decline in share prices, says report. KUALA LUMPUR: Shares of Malaysia’s blue chip companies are expected to remain weak in the months ahead, following disappointing first quarter earnings. According to a report in the Nikkei Asian review the aggregate reported earnings of the 30 constituents of the benchmark FTSE Bursa Malaysia KLCI Index totalled RM11.81 billion in the first three months of the year. This was a drop of 15 per cent year-on-year and 20 per cent on-quarter, according to data from MIDF Amanah Investment Bank. Analysts and investors, the report said, saw little reason to expect any immediate strong rally in Malaysian equities. The reports said the KLCI had shed more than 2 per cent so far this year and that foreign investors continued to sell Malaysian shares for the sixth consecutive week. 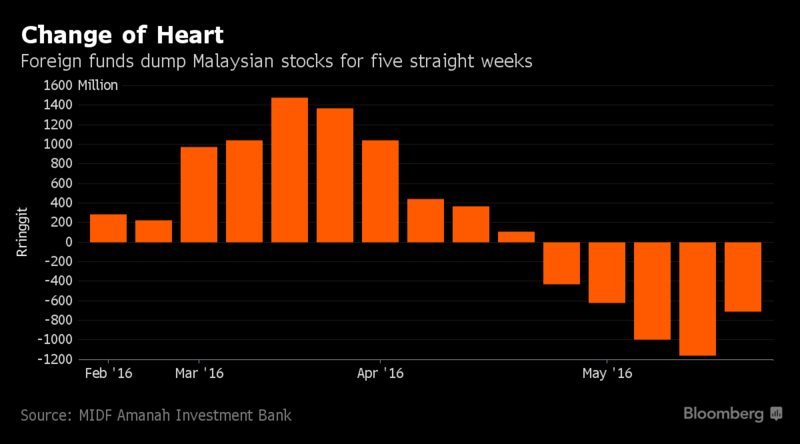 It said the two top banks, Malayan Banking and CIMB Group, had suffered the biggest outflows last week. In May alone, foreigners dumped Malaysian shares worth RM3.5 billion. AllianceDBS Research analyst Bernard Ching told the Nikkei Asian review that although it was unlikely that growth would pick up in the near term, net interest margins had stabilised and banks were trading below their historical valuations. Malaysia’s economic growth is expected to decelerate to between 4.0 per cent and 4.5 per cent this year, according to a government forecast, from 5.0 per cent last year. PETALING JAYA: The local stock market, which has been largely driven by sentiment thus far, is slowly going back to fundamentals with issues driving sentiment seeming to come to a head, analysts say. “Market sentiment is slightly better now compared with last year as the GST (Goods and Services Tax) impact is tapering off, and political issues like 1MDB seem almost resolved. Looking at the oil price, it's stabilising at US$40 to US$50 per barrel. The ringgit has also rebounded. Definitely, the sentiment is improving,” JF Apex Securities Bhd head of research Lee Chung Cheng told SunBiz. “Of course, on and off, there will be some sentiment-driven activity, that’s why the market is still trading sideways. It goes up, and then comes profit-taking. That part may be driven by a bit of sentiment. People are not very confident about the market moving forward,” he said. Lee expects investors to remain on the sidelines in the second and third quarters due to uncertainties ahead. “Most probably market corrections will happen, but there might be some pick-up approaching year-end,” he said. While there was huge foreign buying in the first quarter, Lee is of the view that the momentum is likely to taper off going forward in anticipation of a US interest rate increase. The FBM KLCI closed down 2.77 points at 1,657.850 yesterday. It has fallen 2.05% year-to-date. Inter-Pacific Research Sdn Bhd head of research Pong Teng Siew said the valuation for the local stock market is still expensive considering that the small caps have had the biggest run-up since the Asian financial crisis in 1998. “Prices have not really come off a lot. It still reflects a lot of optimism and confidence in small caps. That makes Malaysian small caps pricey,” he said. Pong said blue chips have shown a fairly good rebound, but the rebound may come to an end or has already ended. “I notice that foreign fund inflow has been driving it. From record, the pace of flow doesn’t exceed a certain level. The net purchase by foreign funds rarely exceeded RM2 billion in a week. “I think it will taper off, it might come back again, but I won’t put all my bets on foreign funds,” he said. On the currency front, Pong does not rule out the possibility that the ringgit will rebound to 3.70 or 3.80 against the US dollar. “It will happen as the Fed is undecided whether to raise interest rates or not, so the US dollar strength has eased off, and that will allow the ringgit to come back to the 3.80 level,” he explained. Meanwhile, BIMB Securities economist Imran Nurginias Ibrahim said market sentiment is taking on some risks. “The ringgit now strengthening against US dollar is because of more positive sentiment due to the US Fed’s decision to hold interest rates,” he said. Imran noted that market sentiment is more skewed towards the currency market. “If the ringgit continues to strengthen, you might see our stock market reversing a bit because our shares will be expensive for foreign investors. “For the currency market, investors might be waiting for the right time to come back, but it depends on the confidence level and the domestic issue,” he said. What would be some of your investment themes for the second half of 2016? Clearly the global economic growth environment has become anaemic. Sentiment is weak and cautious across the board. Despite easy and cheap money globally, capitalist animal spirit is missing. Such conditions make equity investing difficult. Equity investing depends highly on growth, the lack of which limits its upside. On the other hand, cheap money has propped up all financial assets valuations, making things expensive even in the context of slow growth. Our strategy to navigate such a low growth low rate environment is to anchor a large portion of the portfolio into resilient cashflow high dividend stocks. This strategy benefits from further interest rate cuts and capital gains are made from yield compression. When markets are flat to downward biased, and poor economics create more disappointment, I think it makes sense to have more concentrated holdings. The more positions you own, the higher your chances of getting hit. More positions mean more unintended risk taking. Hence, besides our core dividend income strategy, we run a concentrated stock selection where only intended risks are taken. This also makes sense in an environment of high valuations and limited stock selection choice – we should buy more of what we like when we find them. 1. We continue to like yield driven stocks as discussed. This constitutes 30%-40% of our portfolios. When we buy yield stocks, we are looking for those that some semblance of growth, which is the primary driver of capital gains. Hence returns come from yield compression, the actual yield, and capital gains on the growth. 2. The anaemic economic condition in Malaysia is likely to lead to an interest rate cut in the later part of this year. Malaysia has one of the higher rates among developing Asian countries. We think it will join the rest of Asia in dropping rates. This is of course good for yield stocks. 3. We will be keeping an eye out for the PNB group of companies. Potential change in leadership there could lead to restructuring of long underperforming assets. 4. We do not think the syariah segregation of EPF monies will have a big impact, but this needs to be monitored in case the take-up for syariah funds are stronger than expected. If that is the case, it will create further syariah stocks premium. 5. After Pan-Borneo Highway contracts for Sarawak, we think it will move towards the Sabah leg, with its own set of beneficiary companies. 6. The by-election results and implosion of opposition parties could lead to talks of early general election in 2017. 7. The rise of the massive Bandar Malaysia project as more details are released. This project, if it takes off, will change the property landscape of the Klang Valley for the next decade. What sort of stocks would you look at? Our strong cash flow yield strategy has led us to quite a few utilities and infrastructure stocks, which is their basic characteristic. We have positioned a large portion of our portfolio into yield stocks to benefit from potential yield compression. The balances of the portfolio are being run on a concentrated basis on higher conviction ideas. We also have various exposures to Bandar Malaysia construction beneficiaries, companies that could benefit from Pan Borneo Sabah contracts and PNB group of companies. What are the issues that will continue to mar the second half of the year? On the global front, the balance of slow growth versus rising rates continues. As long as this balance is maintained, markets can continue to chug along. If growth becomes too weak, markets could sell off. If it becomes too strong and rate expectations comes back strongly again, markets will also sell off. How this pans out will also determine US dollar strength and hence emerging market foreign flows. Brexit is a clear and present danger for global markets. Unwinding of hedge funds due to redemption has driven many market returns in the first half of 2016. This was due to short covering of their positions. We believe Malaysia was one of the beneficiaries. This trend needs to be monitored further for its impact. Will returns be hard to come by again? The investing world is clearly settling on a lower standard of returns for all asset classes. Low growth low rates and high valuations just do not allow strong returns to be generated without taking excessive risks. Markets are driven by growth and positive forward expectations, the lack of which curtails its upside. Domestically, we think there are limited catalysts to drive the market beyond 5% from these levels. Ample investment liquidity and willingness to support it also means the market is unlikely to fall in a big way. Is volatility the order of the day? Will returns be bifurcated or concentrated, say only on the big caps? Markets are volatile as it is a discounting machine. Markets are a function of future expected events – growth, risks, rates etc. When the outlook is murky, gyrations become common as scenarios changes frequently. Combined with tons of liquidity in the system and efficient information flow, fund flows exaggerate the situation further. The key attribute for investing in the above environment is about quick adaptability. Macro conditions changes and strategies and portfolio positioning needs to change with it quickly. Failing which, portfolios get hurt and left behind. Do you foresee more inflows into bonds or equities in this part of the world? Emerging market flows has been weak. It is also inherently hard to predict. We keep an eye on it for its impact on markets but do not use it as a predictive tool for future market directions. Fitch Rating’s global head Islamic finance. What would be some of your investment themes for Islamic Finance for the second half of 2016? As we have expected, issuance from sovereigns has picked up early in the year and is now followed by banks and corporates. Various factors have supported this trend, such as the recovery in oil prices – although still on the weak side, along with declining Gulf Cooperation Council (GCC) sovereign reserves, liquidity in financial systems, and moves by issuers to tap the capital markets before the next Fed rate hike. We expect sukuk issuance to remain relatively strong in the second half of the year, based on the pipeline of deals and the potential for some governments to issue debt to make up for weak oil revenues. It is worth noting that the third quarter is likely to be quieter, due to the combination of the summer break and Ramadan. Overall our expectation is for 2016 sukuk issuance to at least match 2015 issuance. Any new development that will see more growth in Islamic finance? New sukuk laws in some countries should support issuance by helping to create a standardised structure and improving transparency. The trend of gradually increasing use of syariah-compliant borrowing as more countries create legal frameworks is likely to support issuance, and as issuers attempt to attract a broader investor base, including Islamic finance investors. Which regions will Islamic finance see futher progress this year? Islamic finance is systemically important in many jurisdictions, including the GCC and Malaysia and is growing in the wider regions of Middle East, Asia and even Africa, where there is significant potential and demand for infrastructure Islamic financing. What would be some of your investment themes for fixed income for the second half of 2016? We are seeing a cyclical improvement in the global economy but structural concerns, such as high leverage levels and weak productivity, remain. Secondly, uneasy policy truce appears to be at work among global central banks. Third, debt overhang sees policymakers sanction unconventional methods, such as negative interest rates in Europe, to boost economic growth. Fourth, emerging market differentiation is getting more pronounced with fragilities within political and fiscal arenas being exposed. Fifth, economies are awash with liquidity from central banks, but this is not translating to liquidity in financial markets and is therefore increasing the costs of investing. Will we continue to be in a position where returns are hard to come by again? We believe that with US rates still low, European and Japanese bond yields in negative or close to negative territory, the chase for attractive yield will likely encourage investors into emerging markets. Will we continue to see low single digit returns in emerging market fixed income in the second half of the year? We believe that emerging markets in general – both hard and local currency – are even more attractive today than two years ago. If risk sentiment continues to be positive, we anticipate that emerging markets could end the year with returns in the high single digits. However, a change in risk sentiment or a hawkish US Fed could make it more challenging for investors in the sector. Do you see more inflows into fixed income in emerging markets? We believe that with indications that the US Fed is likely to stay on hold in June and potentially July, investors will look to emerging markets as a source of opportunity to generate return and yield in their portfolios. So flows may improve in the coming months if the US Fed does not raise rates later this month. Do you see the spread widening in Emerging market foreign currency debt? We believe that a lot of the spread widening occurred during the second half of 2015 and the first quarter of 2016. So the likelihood of further spread widening will be a function of expectations of a US fed rate hike. This coupled with worsening credit conditions may impact spreads. However, we believe the market was priced last week for this and now looks cheap relative to the anticipated trajectory of the US Fed rate hike given the poor US employment numbers. Are you particularly underweight or overweight on any asset class for the second half? Our bias is to hold high quality countries and companies where yields have overshot their fundamentals. We tactically prefer Latin America over Asia given that Latin America sold off more than Asia. However, we still find attractive places to invest in the Asian region. Asia for us is generally a defensive allocation within the emerging market universe, and so we will tend to have allocations to select Asian countries where we anticipate further loosening of monetary policy which will benefit bond investors like us and to hedge our risk in the event that the market sentiment turns bearish. The second half of 2016 will likely be another period of volatility, starting with the US FOMC meeting in June, Brexit referendum on June 23, the higher possibility of a US rate hike and the uncertainty surrounding the US presidential race. We are cautious on the market but remain on the lookout for any correction to add good fundamental stocks with strong and sustainable business models, healthy balance sheet, management with good track record and preferably with a decent dividend yield. Domestically, depending on the outcome of the upcoming by-elections in Selangor, it may be a pre-cursor to an early general election in 2017. Stick to the basic principles of investing, with so much volatility expected, and hence uncertainty to follow, stock picking will be the key. We like companies with strong and sustainable business models, healthy balance sheet, management with good track record and preferably those that give decent dividend yield. With the level of volatility, and the many variables and outcomes investors have to consider, returns will be harder to achieve. I understand we are still in an environment of low interest rates. That has caused a rally in our bond market. Do you see this trend continuing? Market expectations are that the US Federal Reserve will resume hiking rates in the near to medium term, although at a gradual pace. Fed chairman Janet Yellen has made public statements in recent weeks reiterating that the Fed funds rate will need to be raised gradually. FOLLOWING six tumultous months of twists and turns, stocks and bonds seem to be back exactly at where they started the year. However, to everyone’s surprise, the prevailing sense of bearishness across asset classes has largely abated as markets did not experience a sustained collapse as feared by many. While previous fluctuations can be attributed to market uncertainty and changing sentiments, there are now emerging signs indicating a sustained recovery across asset classes, which bodes well for the remaining half of this year. Many investors have moved into cash and conservatively cut down their investments, but the stock markets in particular have remained resilient, as shown by the two major US indices currently hovering near their highest in seven months. “To the surprise of many, equity markets did not react negatively to the US Federal Reserve’s potential rate hike in June. Investors are now of the opinion that economic data and growth are on an upward trajectory. Today, we can much more confidently conclude that a US recession has been avoided, which is a big change and an important acknowledgement,” said Morgan Stanley Wealth Management chief investment officer Michael Wilson in a June 2 note. The FBM KLCI closed at 1,657.85 points on June 8, which represents a modest decline of 2% to date. Elsewhere, in spite of the gloomy predictions on the state of the US economy, the Standard & Poor’s 500 Index is up 3.7% for the year. Yet the fact that stock markets have remained flat in spite of enduring fears may not be such a bad thing. During the first half of the year, global commodies prices have entered bull market territory after a four-year slump in expectation of a pick-up in demand by major consumers. Crude oil prices have continued its upward trajectory due to robust industrial demand, as evidenced by recent Chinese data showing a 38% jump in its crude imports during the month of May. Brent crude prices rose to US$52.86 on June 9, its highest this year. Meanwhile, crude palm oil prices remain near its highest in nearly two years as prolonged dryness from the El Nino phenomenon continue to impact production over the first half of this year. Apart from the renewed strength in commodities, emerging market currencies have remained resilient throughout the year. The ringgit remains among the best performing currencies globally with a 6% of the year thanks to improved sentiment as well as a slowdown in portfolio outflows by foreign investors. Meanwhile, Japan’s experimentation into adopting negative rates have not yet brought the desired outcome, which is a pick up in borrowing by Japanese corporations. According to Morgan Stanley, Japan’s private-sector growth has slipped the most in recent months among developed markets globally. With the possibility of more developed countries cutting back on their interest rates, emerging market bonds such as our own Malaysian government securities (MGS) may see continued buying interest thanks to its high yields. THe 10-year MGS currently yields about 4%, which is considerably better than European sovereign bonds whose yields have tumbled to new lows this week. In a recent note, Standard Chartered highlighted the solid buying interest in Malaysian government bonds due to the favourable monetary environment. “We maintain a positive outlook on Malaysian government issues due to Bank Negara Malaysia’s accommodative policy stance and limited inflationary pressure. Local interest to buy fixed income assets remains constructive on ample cash with long-term investors and a weaker macro outlook,” it said. Among the major events that could sway markets over the next six months are the Brexit referendum on June 23 and the US presidential election come November. The bearish trend in the equity market is unlikely to abate anytime soon as we enter the second half (H2) of this year. With current trends pointing to Malaysia continuing to fall outside the radar of foreign investors despite a surge in foreign fund inflow into Asia, the spotlight is on local institutional investors – particularly government-backed funds – to prop up the local bourse. Although global liquidity continued to flow back to Asia for the second week (May 23 to June 3) at an accelerated pace, MIDF Research observes that foreign selling on Bursa Malaysia continued for the sixth consecutive week – the longest-selling streak since September. KUALA LUMPUR: Bursa Malaysia is likely to ease next week on lack of local leads and with sentiment weighed down by the growing concern about the coming Brexit referendum. The referendum, to be held on June 23, 2016, will decide whether Britain should exit or remain in the European Union (EU). Affin Hwang Investment Bank Vice-President and Retail Research Head, Datuk Dr Nazri Khan Adam Khan, said the uncertainty surrounding Brexit has caused most central banks in Japan and EU countries to hold onto their stimulus packages. "The central banks are not willing to proceed with any stimulus plans pending the outcome of the referendum at the moment," he told Bernama. Nazri Khan said the increase in Bank Negara Malaysia's international reserves from RM300 million to RM382.6 billion (equivalent to US$97.3 billion) as at May 31, however, should cushion any weaknesses. "The surge may also strengthen the ringgit against the US dollar," he said. He said the Federal Open Market Committee (FOMC) meeting from June 14-15, 2016, will also be closely monitored by investors following the US Federal Reserve Chair Janet Yellen's recent statement of a possible interest rate increase. "With all these factors, we expect trading levels to trend lower at between 1,640.00 and 1,630.00," said Nazri Khan. For the week just-ended, the benchmark FTSE Bursa Malaysia KLCI (FBM KLCI) eased 9.29 points to 1,641.22, as investors remained on the sidelines ahead of the FOMC meeting next week and weak China export data despite the ringgit's appreciation against the US dollar and higher oil prices. On a week-to-week basis, the FBM Emas Index rose 39.06 points to 11,500.57, the FBMT 100 Index gained 38.01 points to 11,192.05 and the FBM Emas Syariah Index was 73.41 points higher at 12,056.71. On a sectoral basis, the Finance Index fell 86.18 points to 14,191.10 and the Industrial Index shed 1.04 points to 3,082.22. The Plantation Index advanced 96.71 points to 7,577.29. Weekly turnover increased to 8.55 billion units worth RM8.25 billion from 7.19 billion units valued at RM13.13 billion last week. Main market volume fell to 5.61 billion shares worth RM7.73 billion from 5.67 billion shares worth RM12.80 billion previously. Warrant turnover improved to 1.05 billion units valued at RM150.50 million from 736.10 million units valued at RM110.40 million last week. KUALA LUMPUR (June 13): Foreign selling on Bursa continued for the seventh consecutive week, but the pace of the selldown has decelerated significantly, according to MIDF Research. In his weekly fund flow report today, MIDF Research head Zulkifli Hamzah said the net amount offloaded by foreign investors narrowed substantially to only RM169.9 million last week from RM1.19 billion the week prior. He said it was also the lowest outflow in seven weeks. He explained that the estimates are based on transactions in the open market which excluded off market deals. Zulkiflis said foreigners were net sellers on three out of five trading days last week. “Selling momentum from the week before spilled over when trading commenced on Monday, with foreigners offloading –RM28.5 million on the day. “However, the selling ended abruptly on Tuesday with a buying of RM93.8 million. It was the highest daily buying since April 21 this year. “Foreign purchase was extended into Wednesday at RM31 million,” he said. Nevertheless, Zulkifli said buying momentum was halted on Thursday with a relatively heavy attrition of RM163.6 million. He said foreigners then continued to sell on Friday at RM102.6 million. 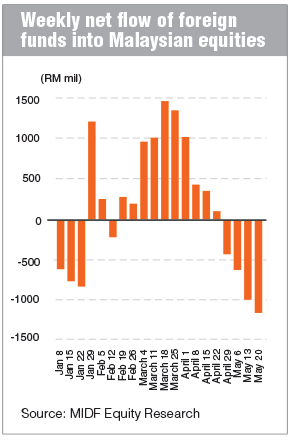 “Last week’s foreign withdrawal further reduced the cumulative net foreign inflow thus far this year into share listed on Bursa to an estimated RM1.11 billion, down marginally from prior week RM1.22 billion. “The figure has been on a declining trend for the seventh week. In retrospect, foreigners had offloaded RM19.5 billion and RM6.9 billion in 2015 and 2014 respectively,” he said. Zulkifli said foreign participation rate plummeted to RM809.9 million last week. He said it was the lowest figure thus far this year. “Trading activities returned to its normal track after investors’ prior week portfolio rebalancing. “Taking out prior week’s outlier data point, foreign participation rate has in fact been declining for three straight weeks. “Foreign trading was active on Tuesday at RM1,141 million,” he said. Zulkifli said that meanwhile, tepid trading was seen on Monday and Friday at RM692 million and RM529 million respectively. He said local institution loaded up RM220 million on Bursa last week. “Meanwhile, its participation rate edged down to RM1.93 billion from prior week’s RM2.2 billion. KUALA LUMPUR (June 13): The FBM KLCI fell 11.45 points or 0.7% with Asian share markets, on concerns the UK may leave the European Union (EU) and as investors anticipated the direction of U.S. interest rates. Reuters reported global market volatility has surged ahead of this week's central bank meetings, as well as Britain's June 23 referendum on whether to remain in the EU. In Malaysia today, the KLCI closed at 1,629.77 points, as investors assessed the impact of the UK's potential EU exit, which is popular known as Brexit. The U.S. Federal Reserve meets tomorrow and Wednesday (June 14 and 15) to decide on the nation's interest rate. Across Asian share markets today, Japan's Nikkei 225 fell 3.51%. In China, Hong Kong’s Hang Seng declined 2.52%, while Shanghai Composite dipped 3.21%. China economic data also dictated Asian share markets, on news China's fixed-asset investment growth was slower than forecast. In Malaysia, Areca Capital Sdn Bhd chief executive officer Danny Wong told theedgemarkets.com that a possible Brexit "might trigger a bigger risk, where other EU countries might follow the UK's example." Bursa Malaysia saw 1.48 billion shares, worth RM1.21 billion traded. Decliners beat gainers at 643 against 203. Hang Seng-linked put warrants dominated Bursa Malaysia top gainers, as investors bought these warrants to hedge against broader market losses.